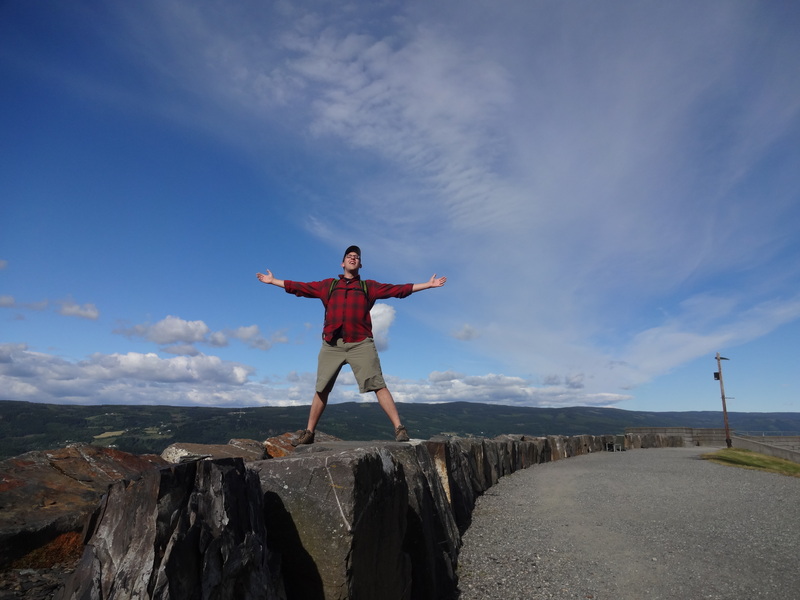 Leaning on the traditional fence post Skigard is found all over the Norwegian landscape. 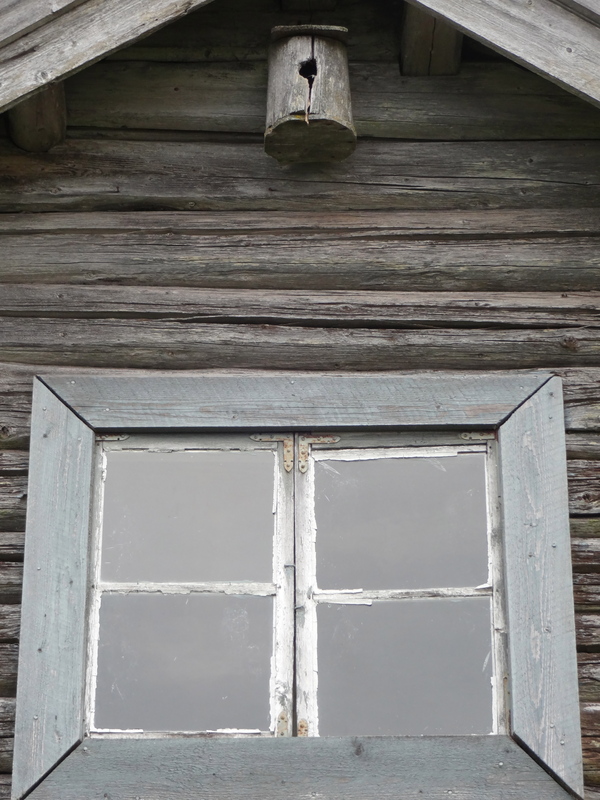 Made from two poles shoved in the ground next to each other and spaced a meter apart, their quartered pine slats tied in between the poles. It is actually quite a sturdy structure and gives the landscape an organic feel. The hayracks behind me are quite old, the grass already turned to hay. 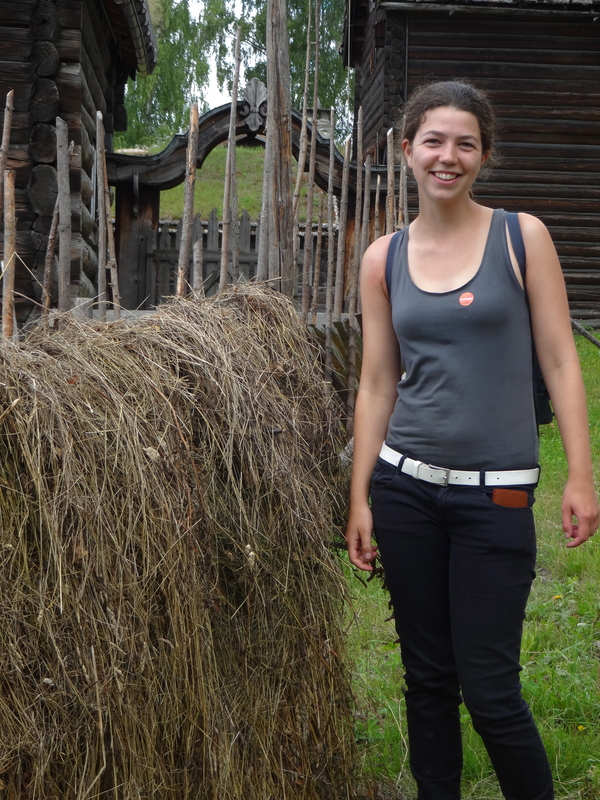 Kim standing next to a hayrack at the folk museum. No where near as expert as our hay-racks on the farm however. My dream home, a little small but who needs more than a bed and a table anyway? 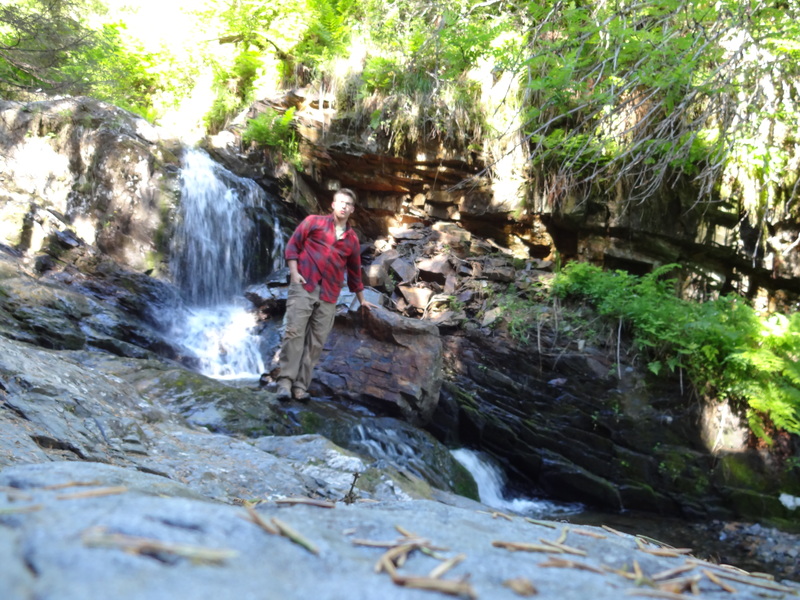 Plus, there’s a stream running under it – I can bath inside! 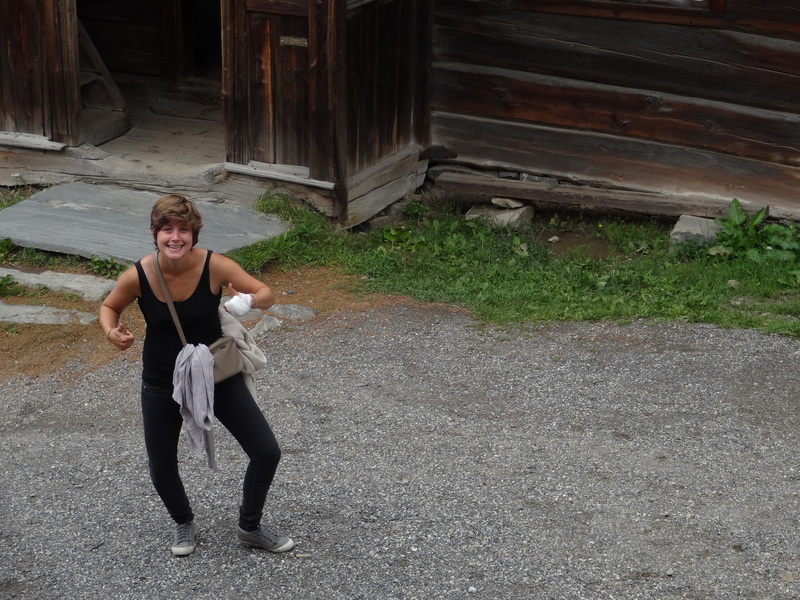 Camille doing the chicken dance in the town square, entertaining the populace. Kim, my wonderful Dutch friend in a candid shot in the towns square. 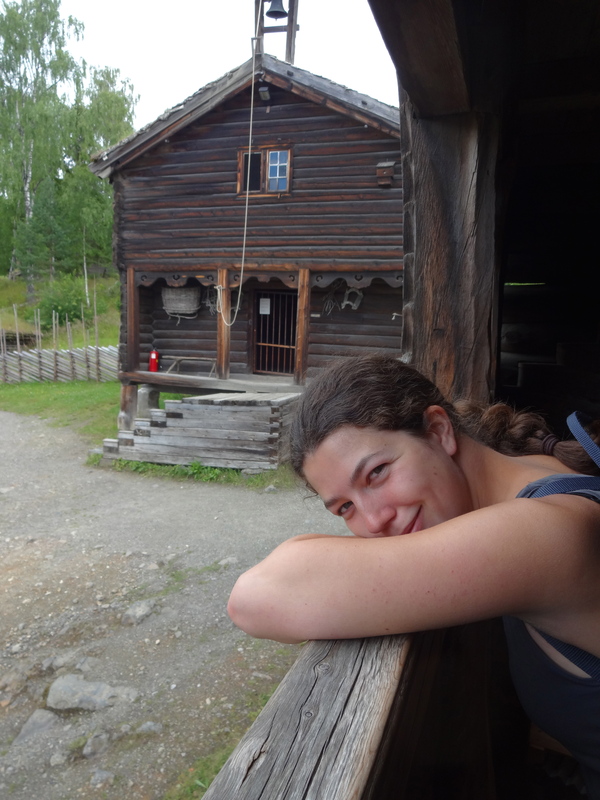 We were standing on the second floor of a log-cabin which is typical of Norwegian homes in the period (which period? no idea lol). 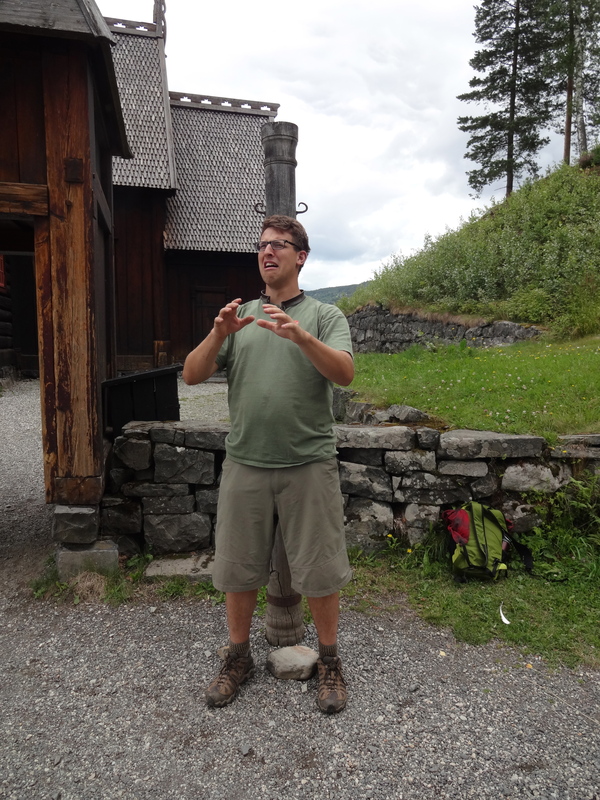 Right outside the Stave Church there was a stout pole with a chain attached to a metal collar. The metal was well-worn, which strikes me as particularly disturbing. 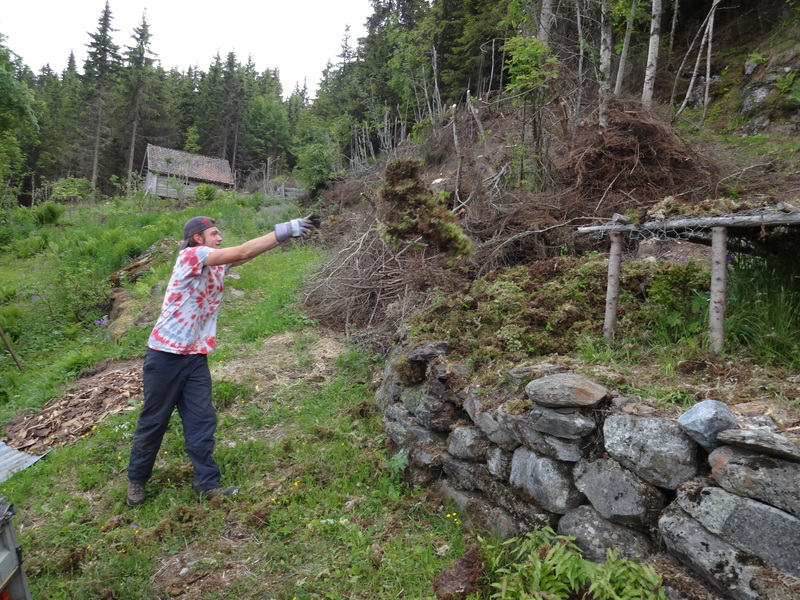 I am guessing this was used for law-breakers, my best impression of a fearful peasant above. 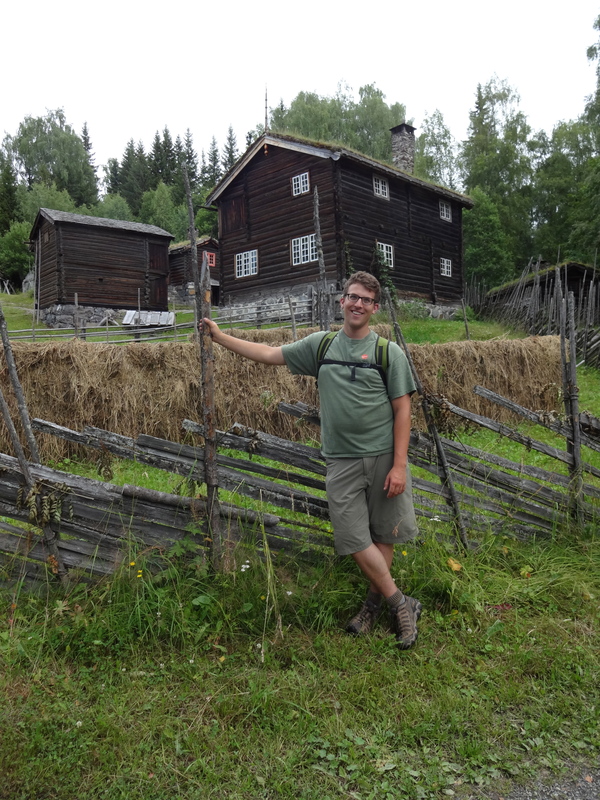 The Stave Church is typical of Norway. 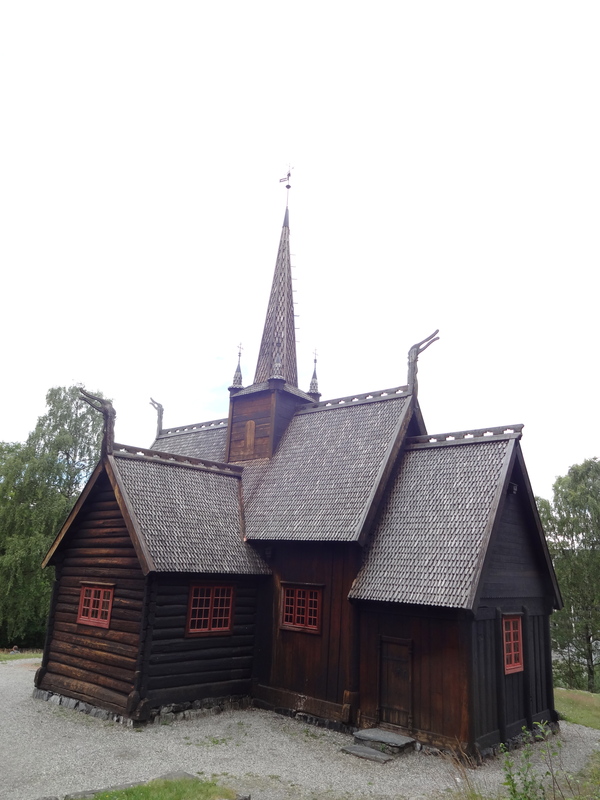 Log-built and covered in wood tar, the shingles made from wood and the essential dragon heads that adorn the roof-peaks are all part of this magnificent structure. This particular building was originally torn down, and then mercifully bought by a caring Norwegian philanthropist who then donated it to the Maihausen (Folk Museum). His bearded portrait hangs in the church’s nave. 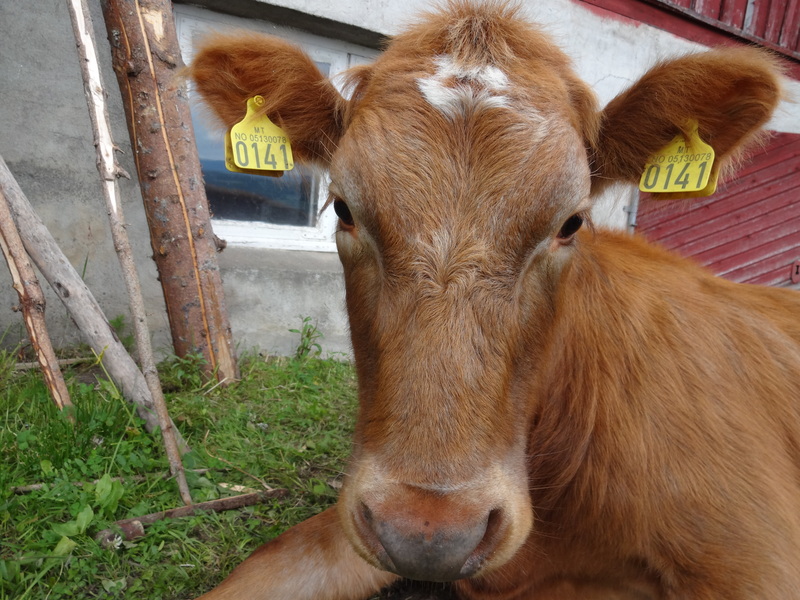 This is our resident (though mischievous) heifer on the farm. 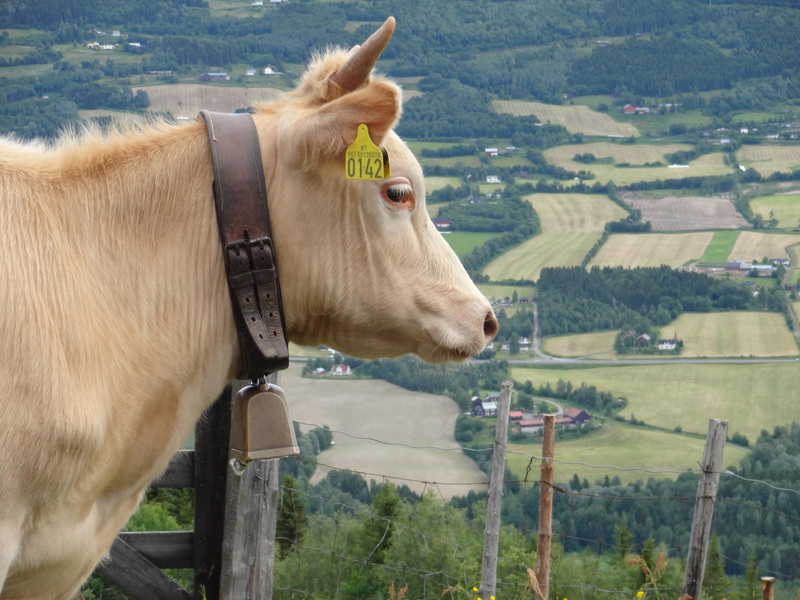 Audhumla is the primeval cow of Norse Myth, and she is rather adorable since she is a traditional Norwegian cow and thus smaller than most. Pictured from left to right, Hanna and Dan, my gracious hosts, Me (The Beardless Farmer), Kim (Netherlands) and Camille (France). 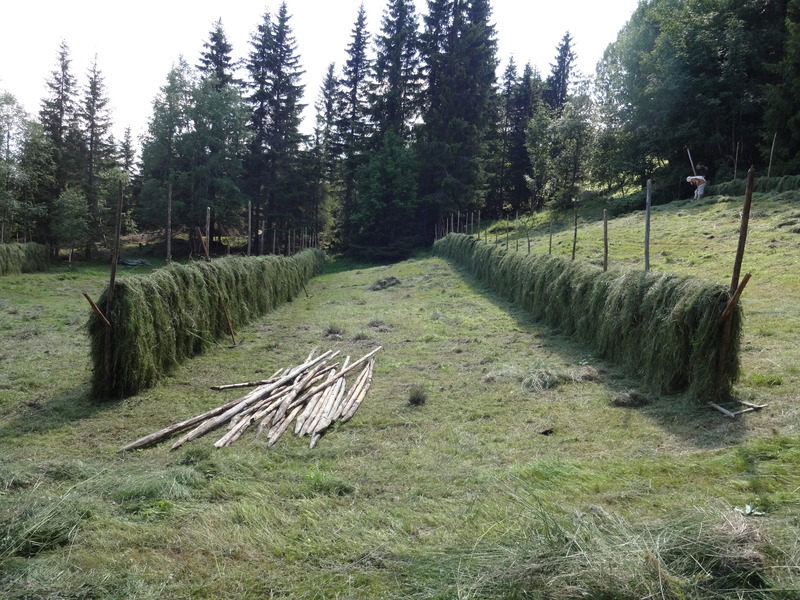 We just finished the hay-rack and it began to rain, perfect timing. This is another version of the wasp proof suit. 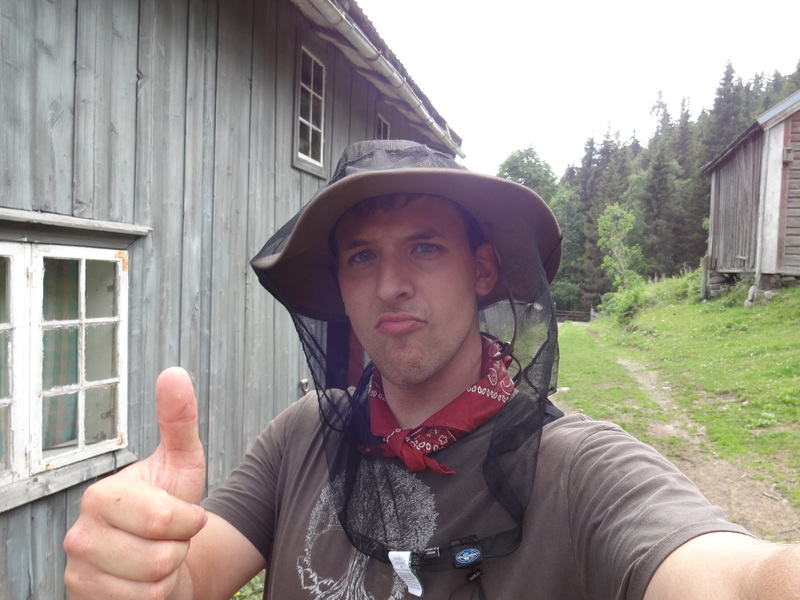 Wearing a traditional wool tunic underneath (not a skirt), rubber gloves and a mosquito-net/cowboy hat – Dan was prepped for the dangers of hay-making. On a pleasant morning, Audhumla graciously accepts the leafy prize in my hand, she also loves bread lol. 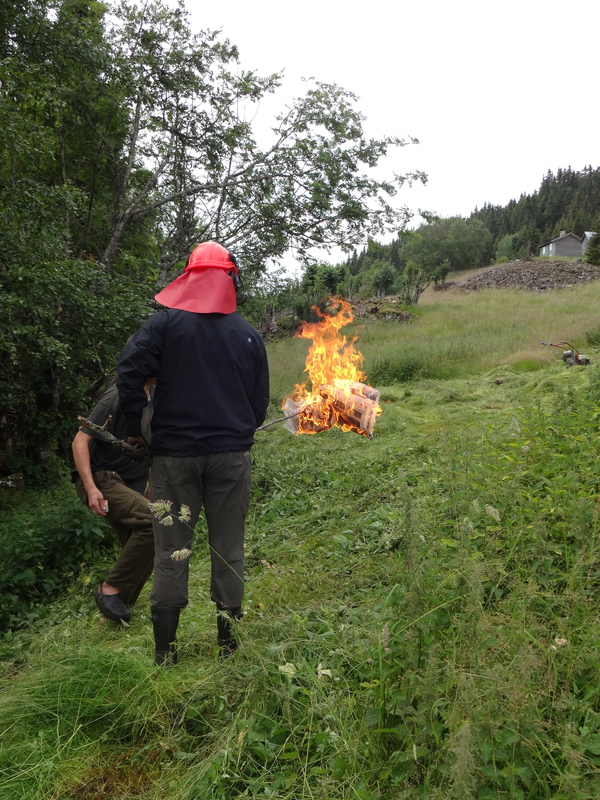 The wasp nest went up like an inferno, luckily it rained the morning of so the ground was still wet. 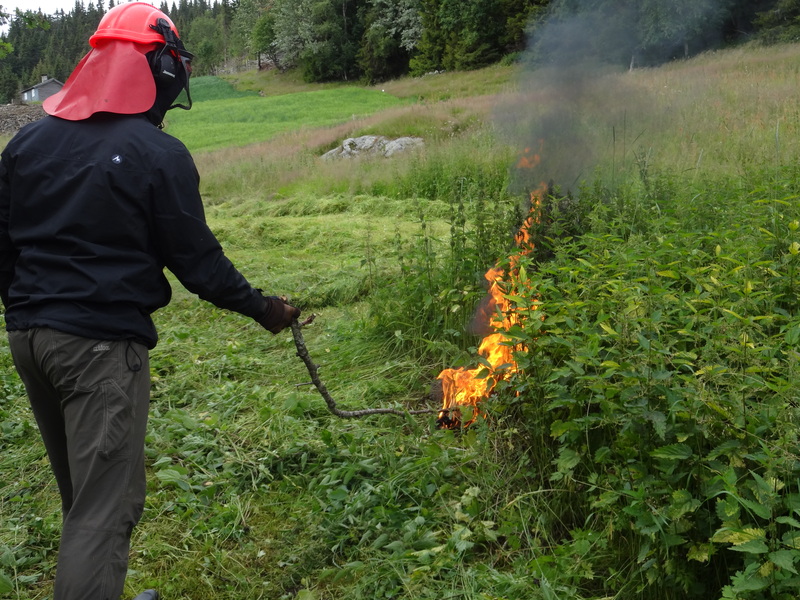 I normally would not condone burning nests but its far better than getting bit or stung in the middle of nowhere. 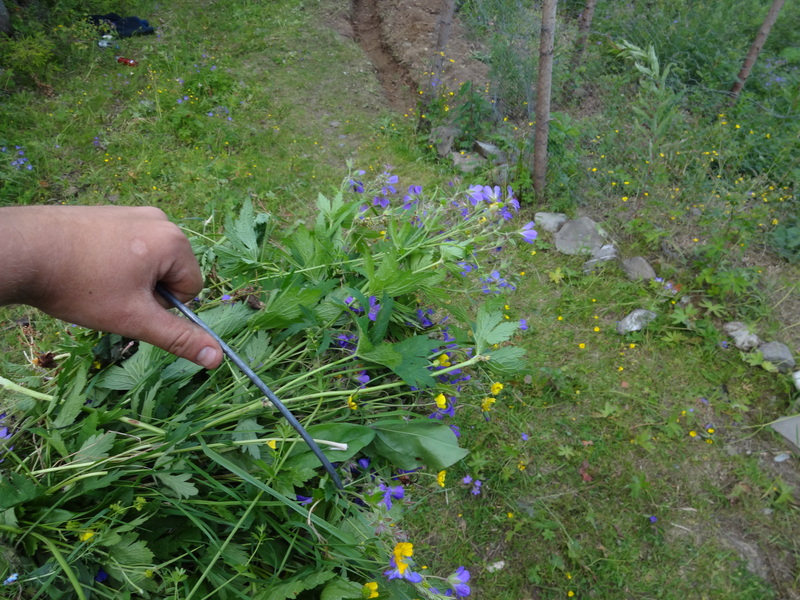 Preparing the long stick-torch, by pouring petrol on newspaper (do not try this at home). 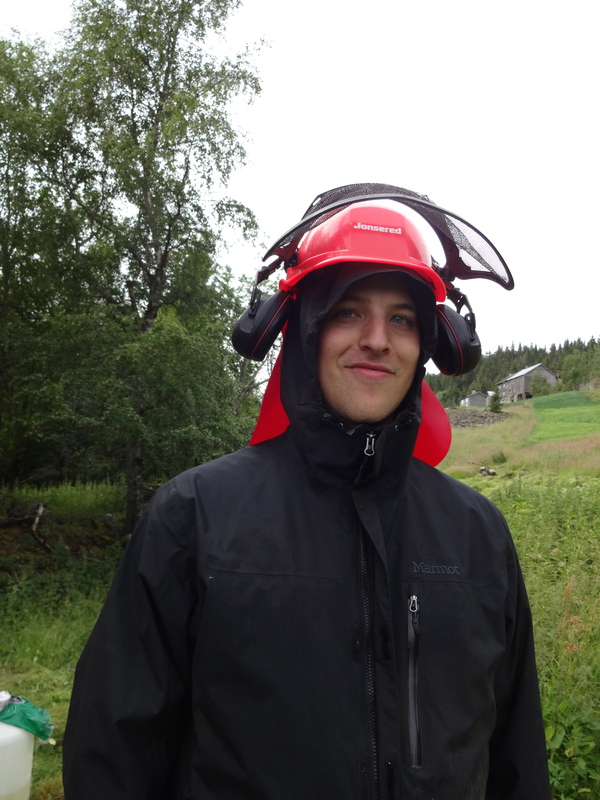 Donning all the gear I could, I am mentally preparing myself to eradicate the Wasp Nest. 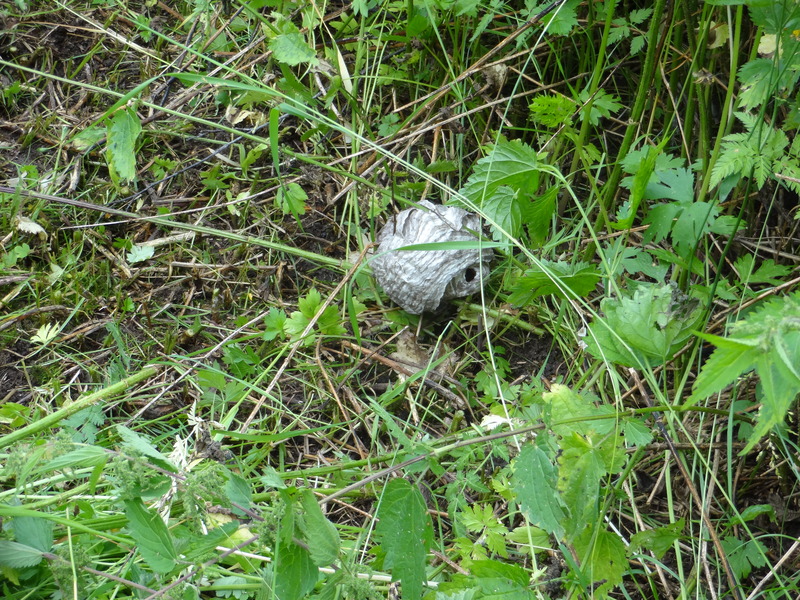 Narrowly avoiding disaster, we found this wasp nest in the middle of the field. Buzzing angrily around their home, the wasps were quick to sting anyone that came too close. 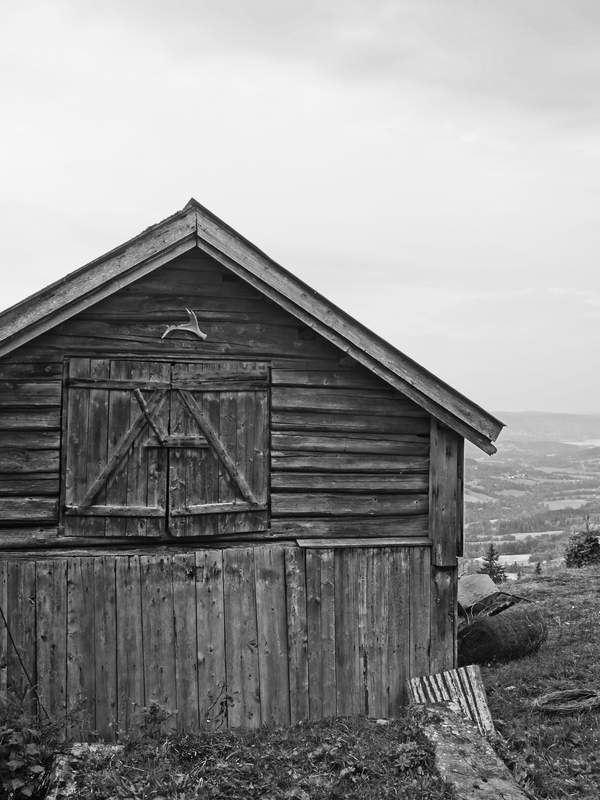 Hayracks and the Hay-barn. 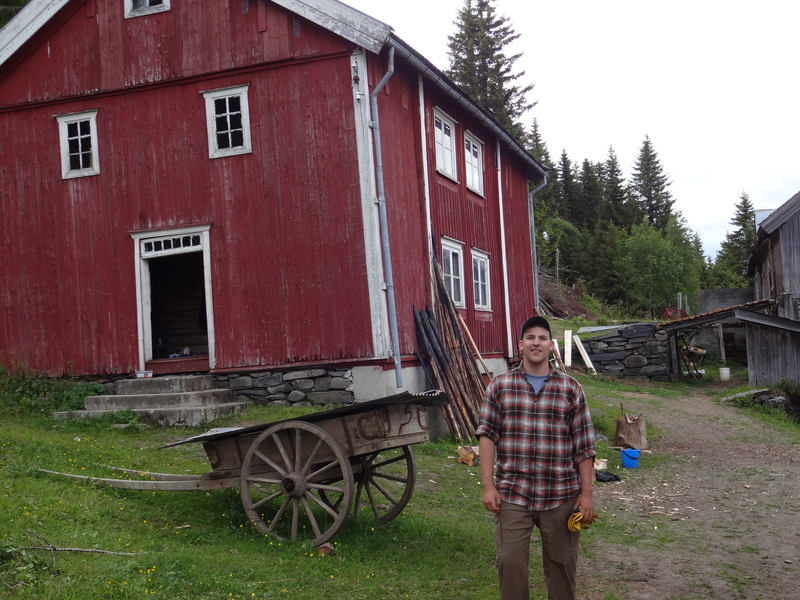 This small building has renovated floors, halved logs of spruce laid flat side down. The barn’s log sides are not perfectly fitting which allows air to flow freely through and thus gives the stacked hay some much needed air filtration. 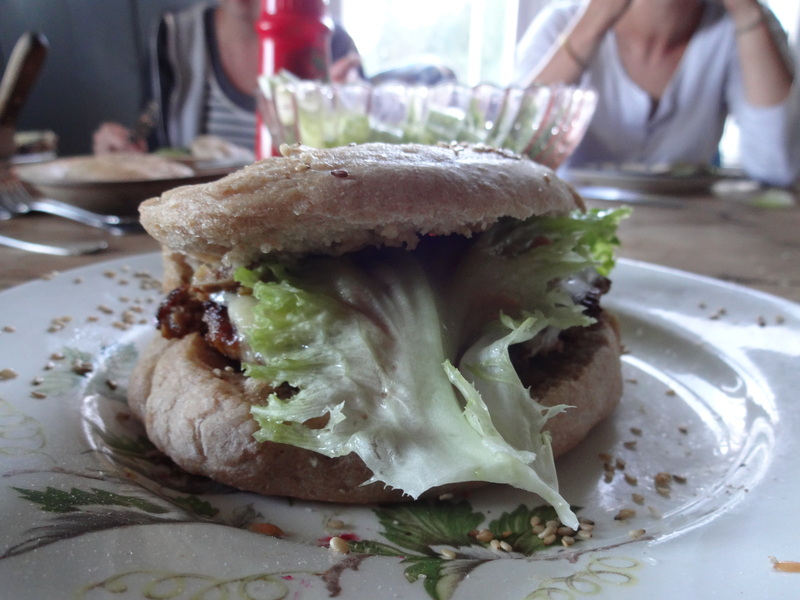 Homemade burgers, with homemade buns, with home-grown salad and home-made fancy sauce (Ketchup and Mayo – mayo is homemade too!). This was a delightful (if not filling) dinner, especially after a day of hay-making. 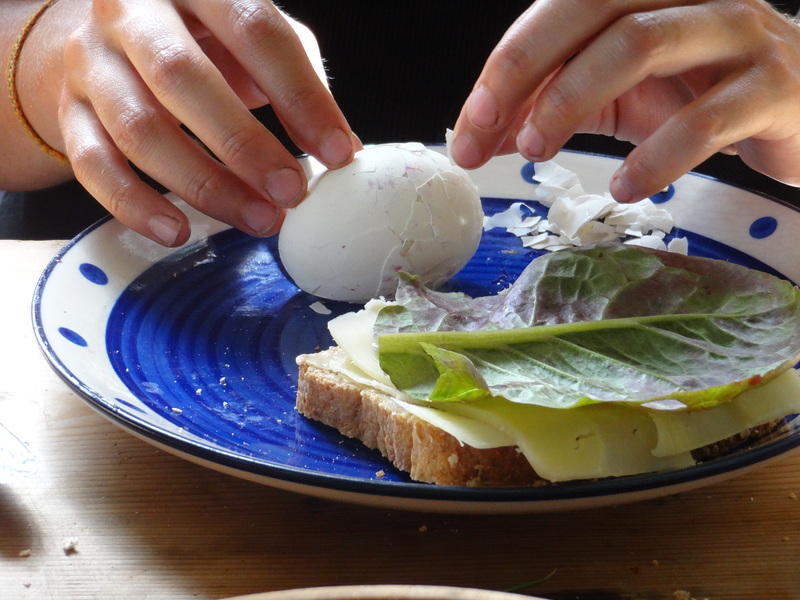 Hard-boiled eggs from the farm, crack ’em, peel ’em, eat ’em – yum. I like mine sliced up small on a hard piece of Wasa bread. 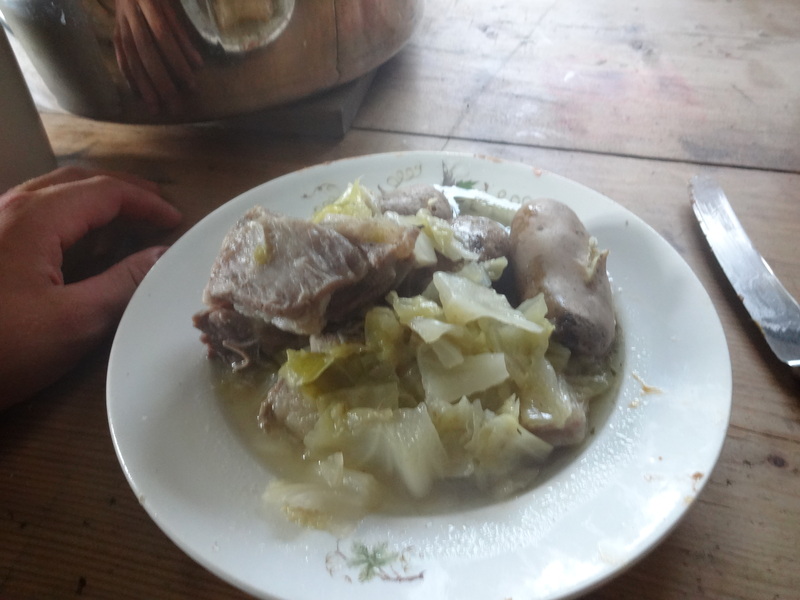 Norwegian high cuisine, mutton (sheep) and cabbage in broth. It was delicious after a hard days work and lasted a few days we made so much – yum! 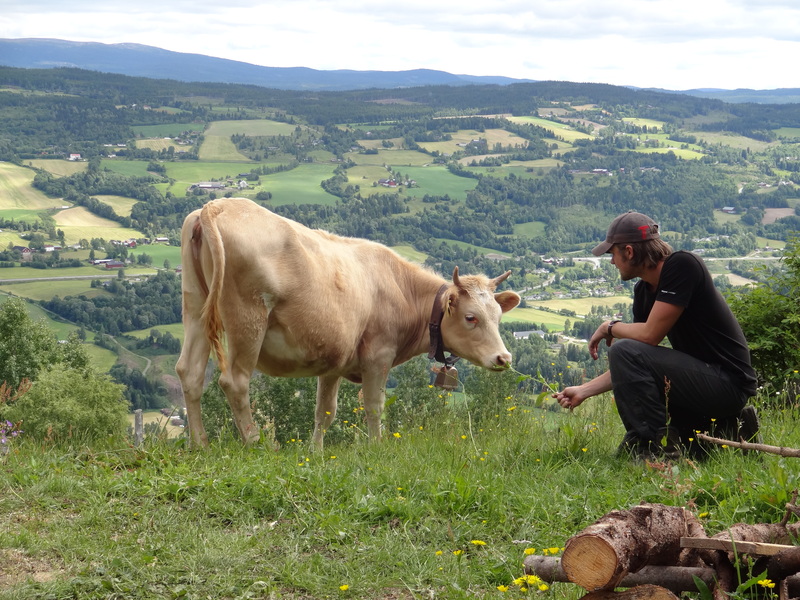 Cow-herding, never thought I would be doing this in Norway. We had to wrangle only one heifer from the herd, dear Audhumla, but to do so we had to bring the entire herd to the gate of the farm. 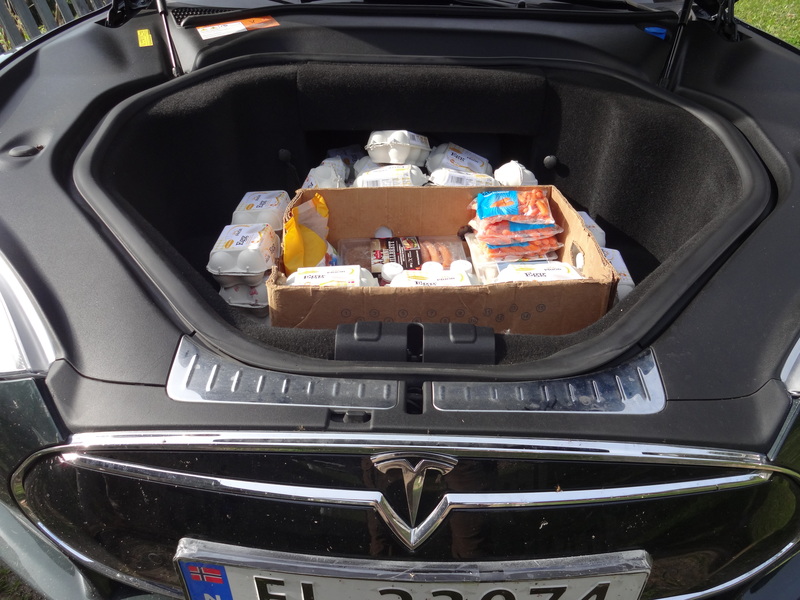 A friend of Dan’s came bearing gifts – in his Tesla Model S! I asked to see the engine and Carl opened up the hood to reveal this treasure – eggs and bacon! The motor is actually located in the wheel hubs, making more room for interesting goodies. Bearded Barley grows in the lower fields at Nordre Stuksrud, this will be harvested and used for grains and perhaps even beer! 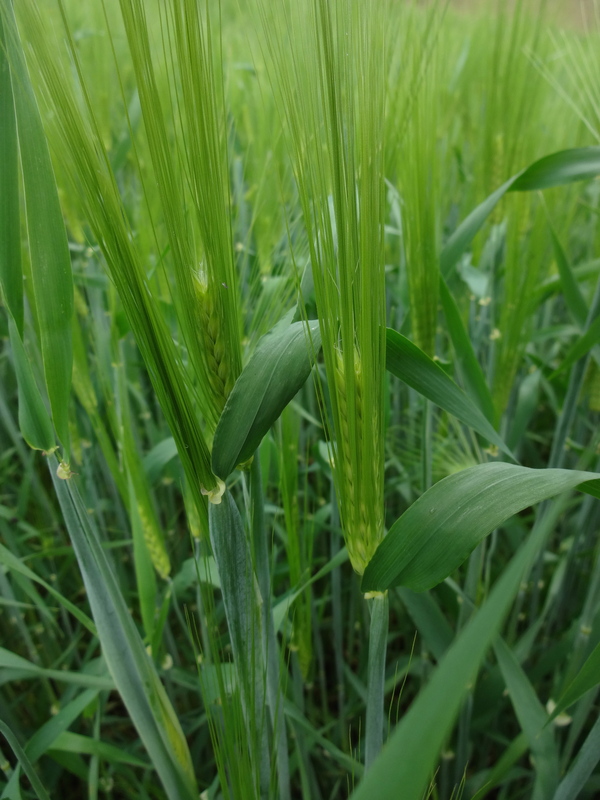 Spelt is another grain closely related to Barley, it has a lower gluten content thus a healthier option and is catching on rapidly in Europe – it is not grown here, though Dan is considering it for next year. 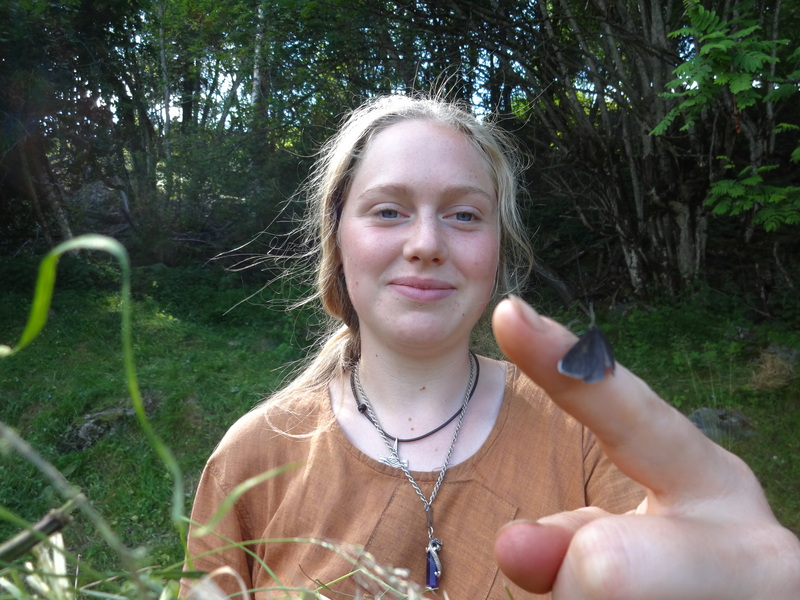 Hanna, my host is the de facto butterfly master on the farm – these peaceful creatures must be attracted to her pleasant and harmonious nature. 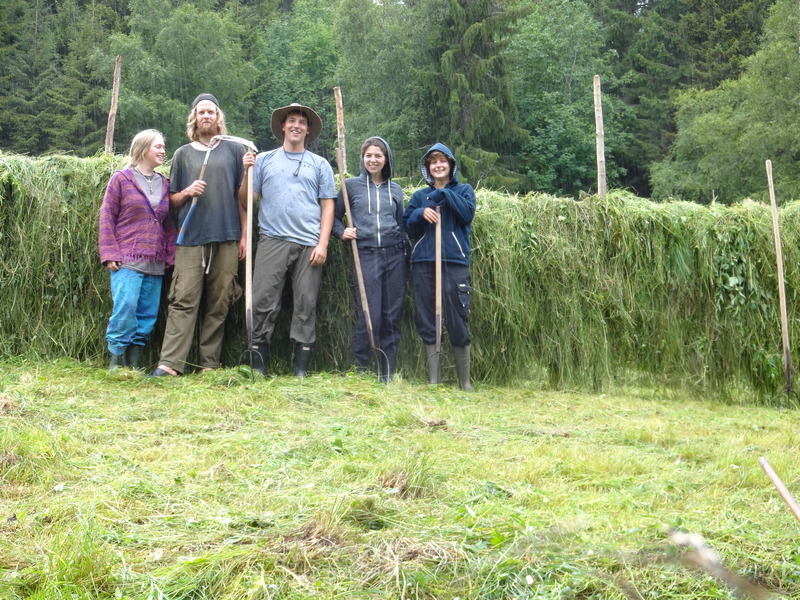 Obviously hard at work, posing for the camera shot, we just completed our fifth round of hay-making. 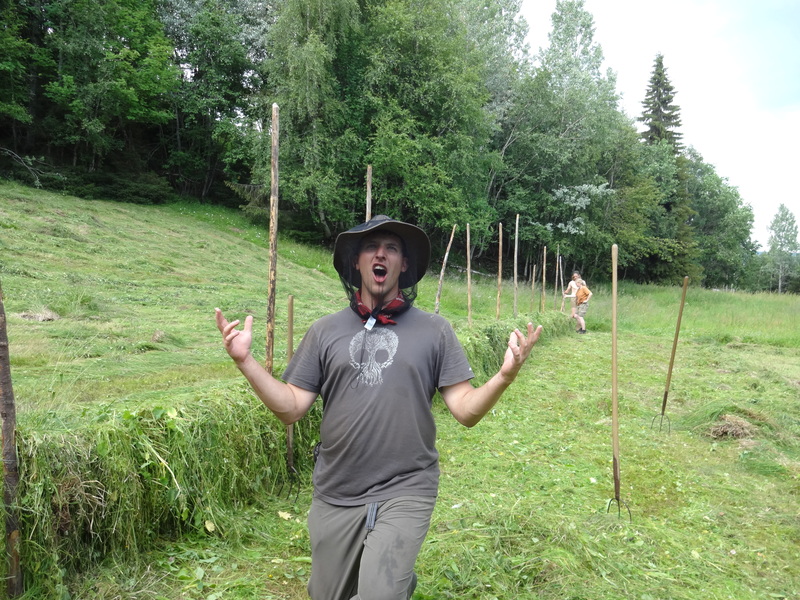 No one ever holds the pitchfork tines up by the way, both impractical and dangerous though for the picture I had to break the rules. 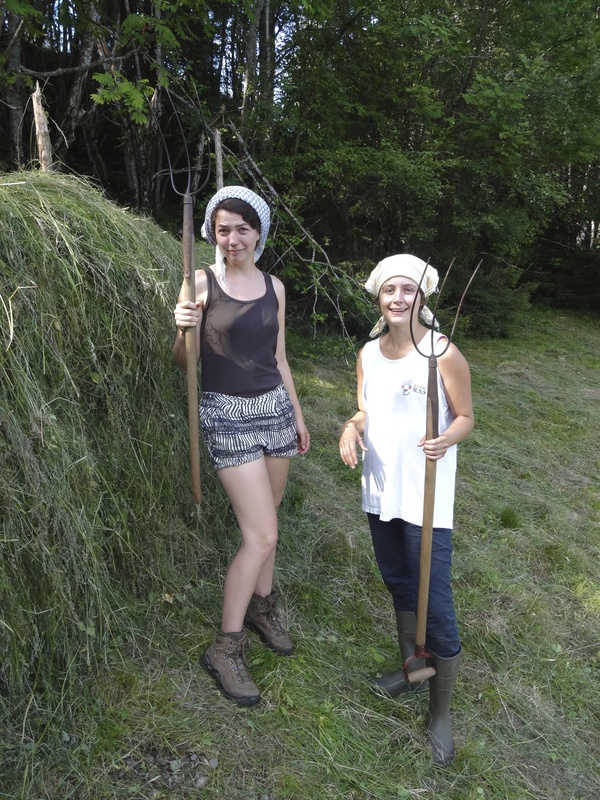 Kim (Netherlands) and Camille (France) also hard at work on the hay-racks. Both are wonderful people, and I am blessed to have to have worked closely with them on the farm. Myself and Kim at the hayracks, we ended up doing a complete photo-shoot. Someone (Camille) was trigger happy with the camera button. 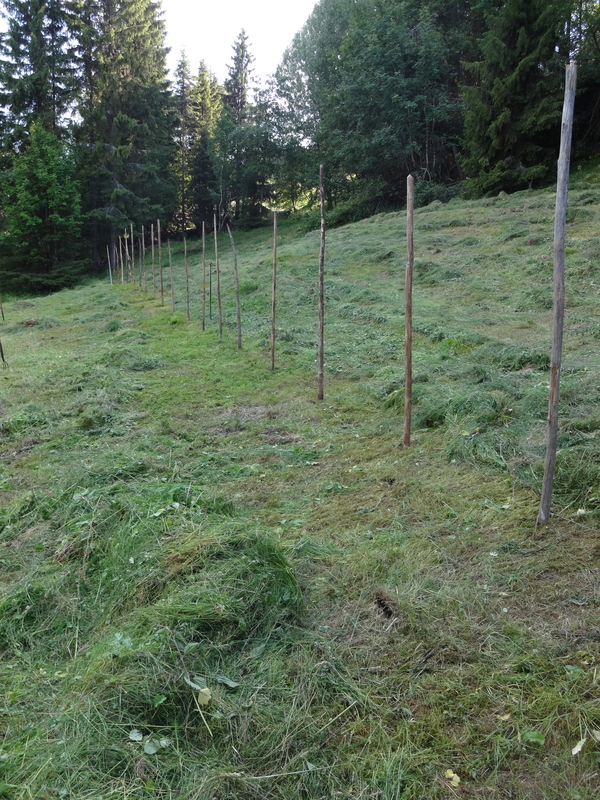 The completed hayrack is literally a wall of green (for a few days) and the space between wire lines provides the grass, breathing room to properly dry out. 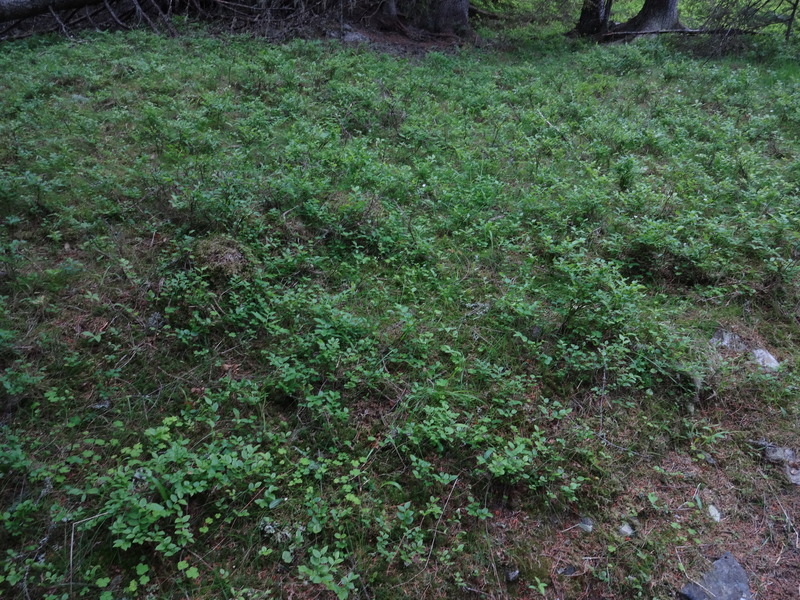 Based on the varied Norwegian weather, grass can take anywhere from four to fourteen days to dry. Right now we have sixteen racks and are only half-way done! 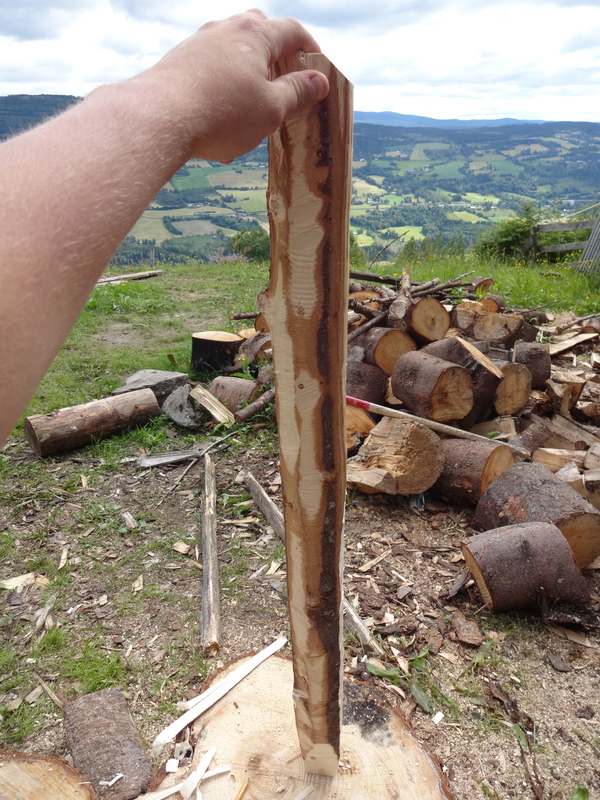 Typically made from spruce branches, these poles are sharpened at the end and shoved into the ground roughly two paces from each other. 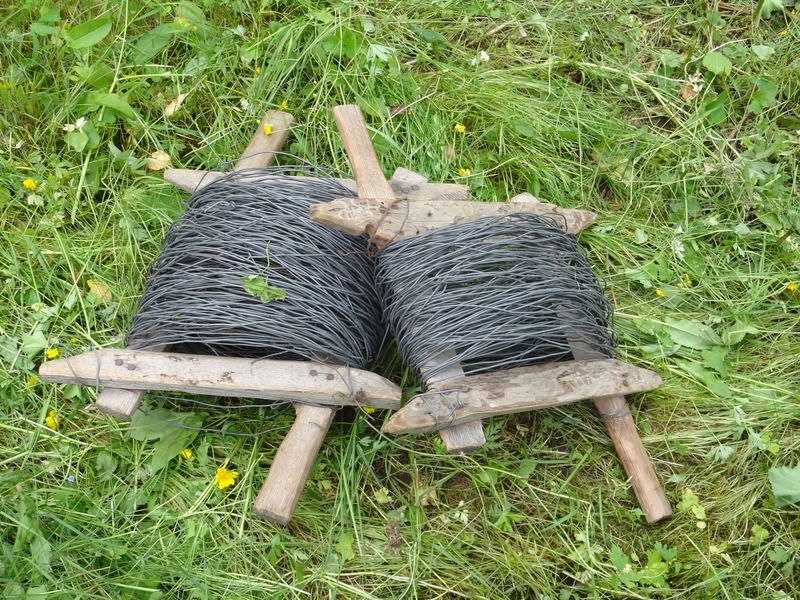 Wire is then wrapped at intervals across to provide a strong bridge for the grass to lay on. 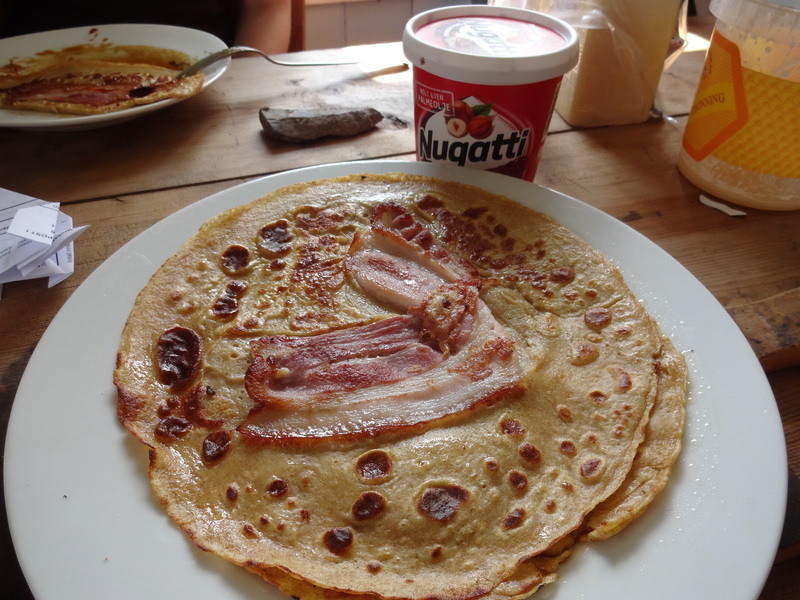 Bacon Pancakes, in the immortal words of my Uncle Ray – never met a piece of bacon I don’t like…especially in the middle of a pancake. 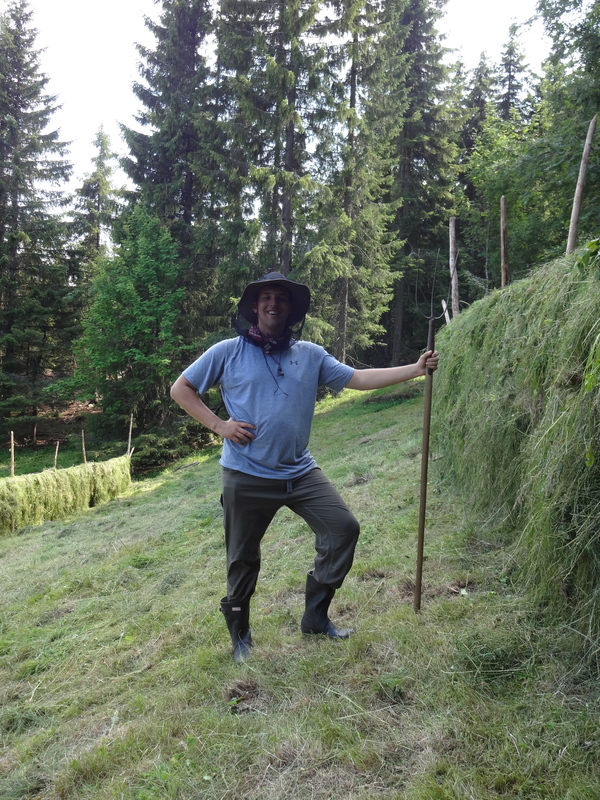 Gearing up for Hay-Making, the bugs are incredibly annoying – the net and the cowboy hat do the trick. Oh my god the bugs! Disturb the grass and out comes the armies of flies. We use galvanized wire to tie up the hayracks, in the old days they would use wooden slats between poles but this is far more efficient. 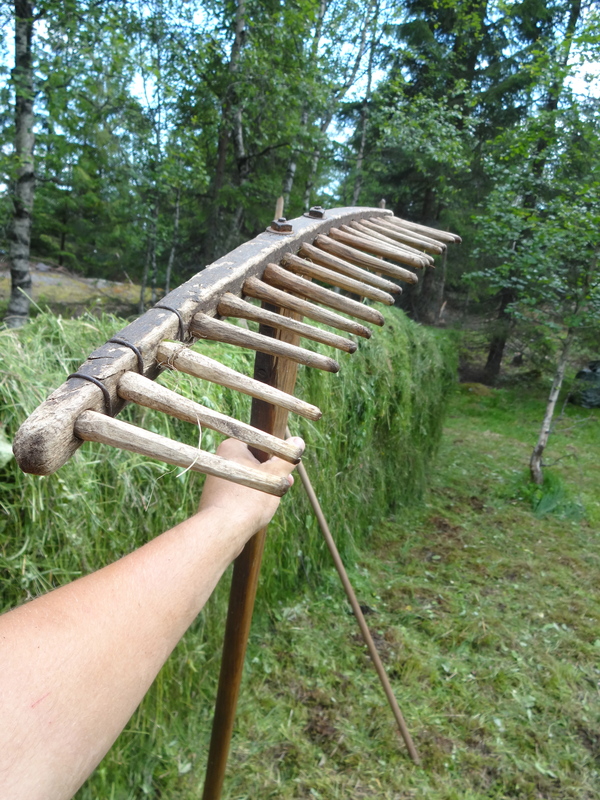 This is the repaired hay-rake, expertly repaired by my host, Dan. The tines are made of birch, we leave them out in the open weather so the wood will swell and become tight in their respective holes. 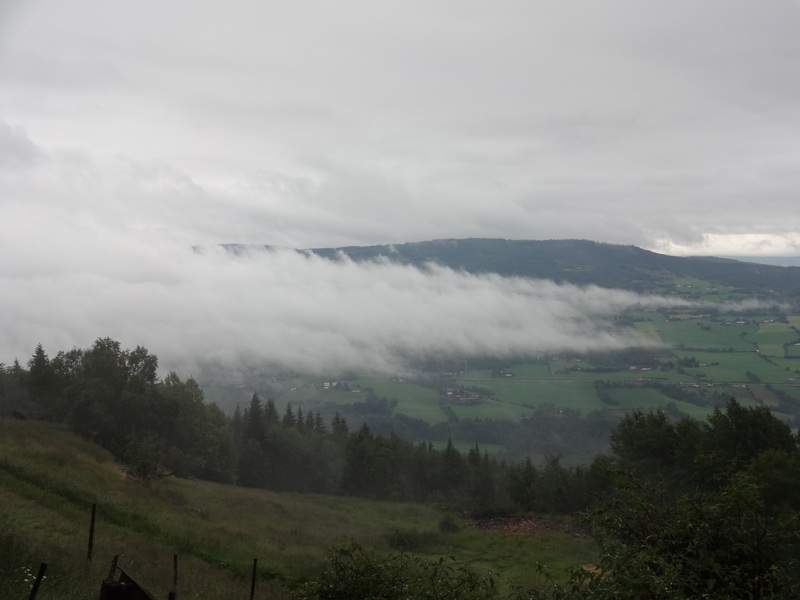 Woke up to the fog taking a stroll through the Gudbrandsdalen Valley. It eventually recedes, but for a long time it sort of pools in the middle creating a river-like effect. Shrouded in a blanket of morning fog, this is what I woke up to in the morning. 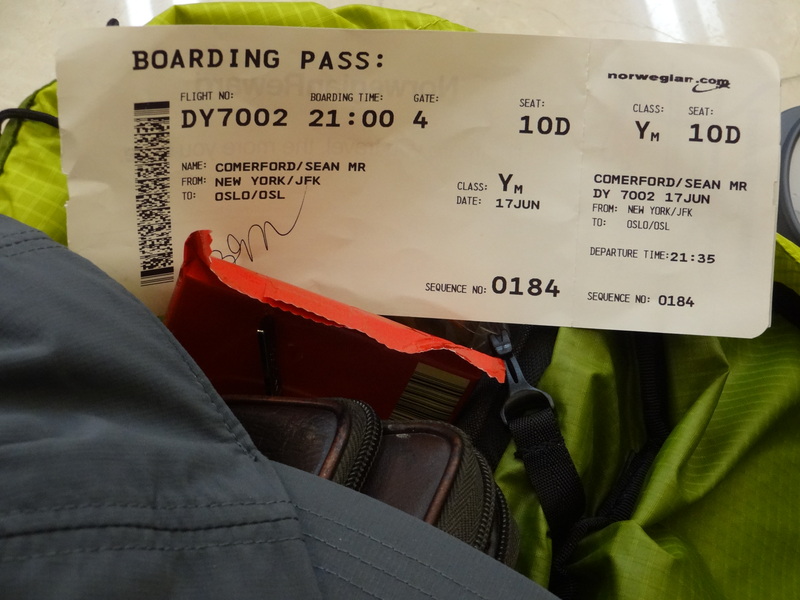 Sitting in JFK, I could here the language of the Norse, it was a welcoming sound. 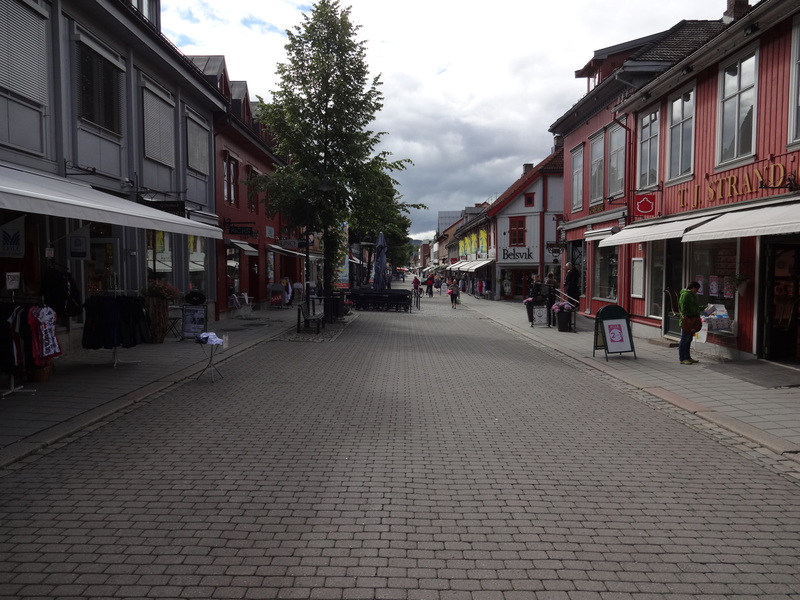 Lillehammer’s main thoroughfare, Storgata – it has all the great shops excellent food expected from a city like Lillehammer. 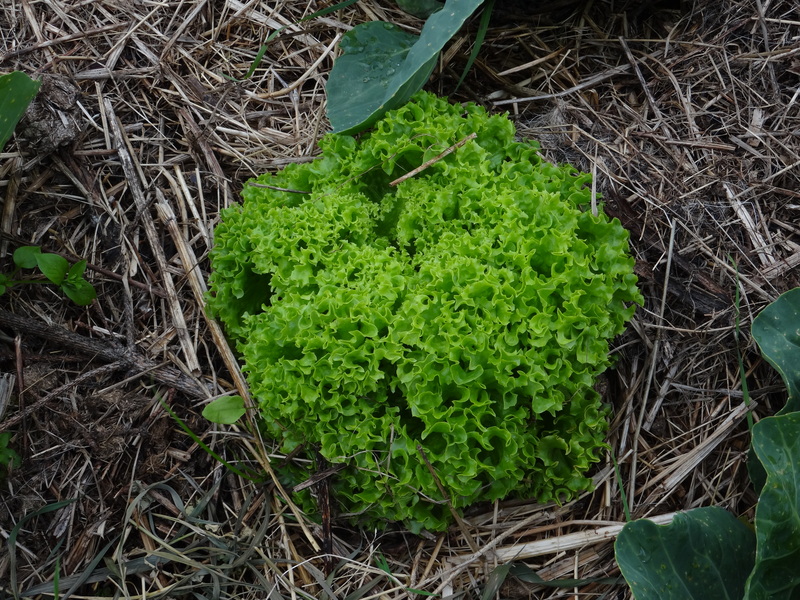 Harvested from the hills around the farm, this moss is several different varieties. 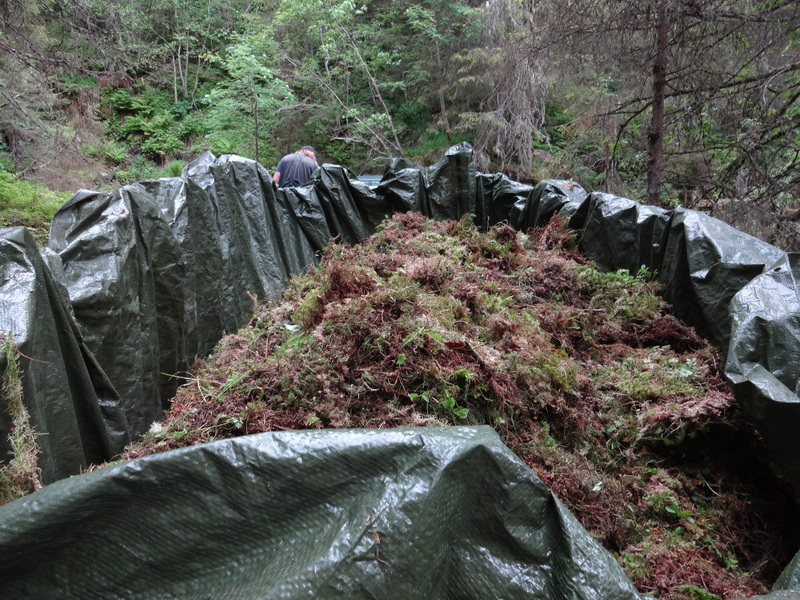 Dried out and used primarily for bedding in the winter for livestock – though I was tempted to just jump in! 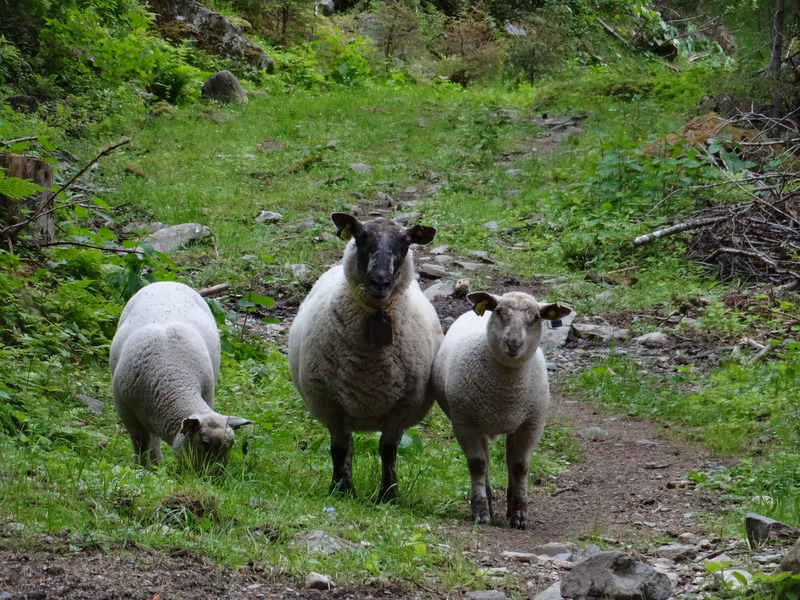 These hardy sheep are let loose from surrounding farms to pasture in the surrounding hills and fields. This particular group are the only ones who did not flee at my approach – and thus have become famous. 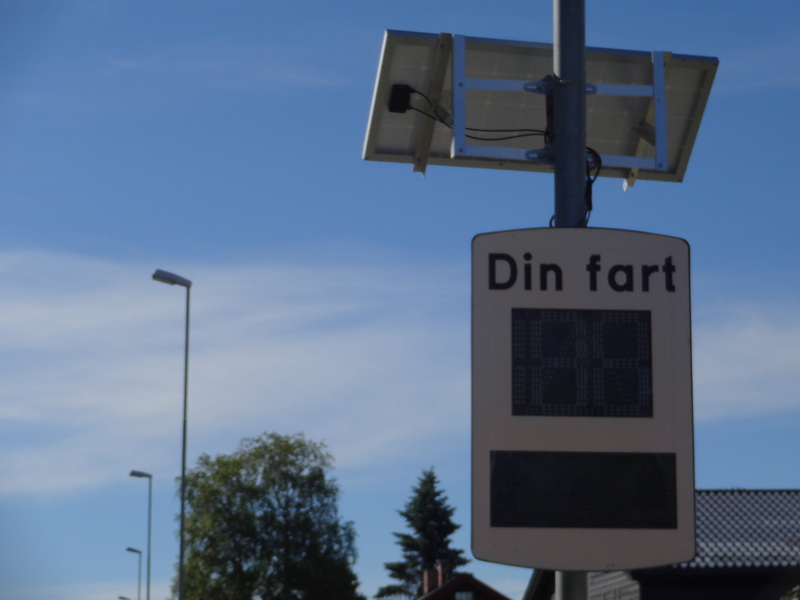 Stuksrudvegen. Pronounced “Stook-srood-waygen,” this is the road to the farm. First impression was of Tolkien’s Shire – deep woods, moss and fern undergrowth and mystical looking rock outcroppings. 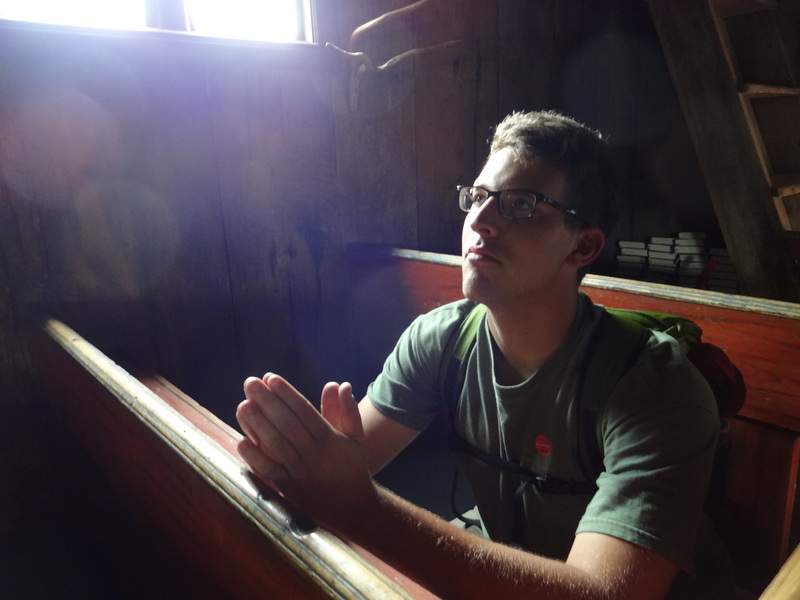 Another volunteer at the farm, Quinn is from Philadelphia, and is a great individual – lots of laughs. 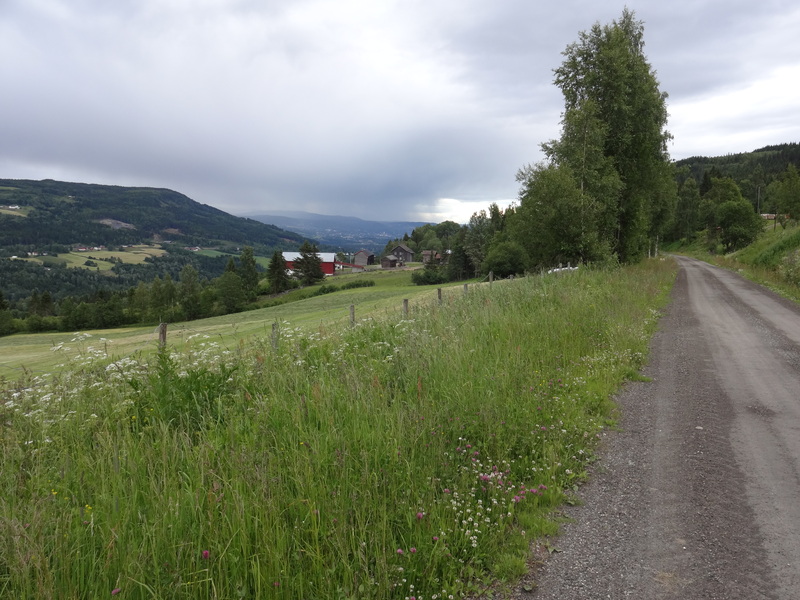 Nordre Stuksrud, this farm is approximately 250 years old, this is the road leading up to it. 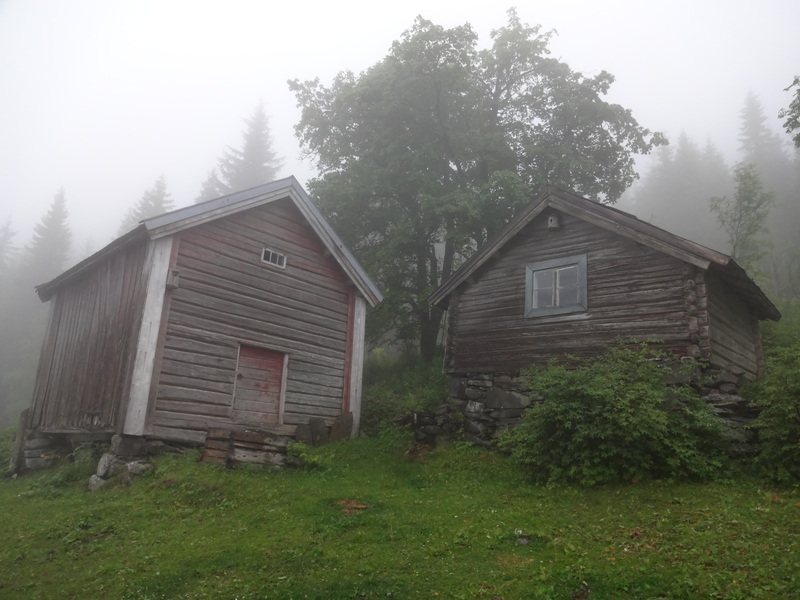 There are several buildings – the one to the left is the carpenter’s shed and on the right is the farmhouse/living quarters. 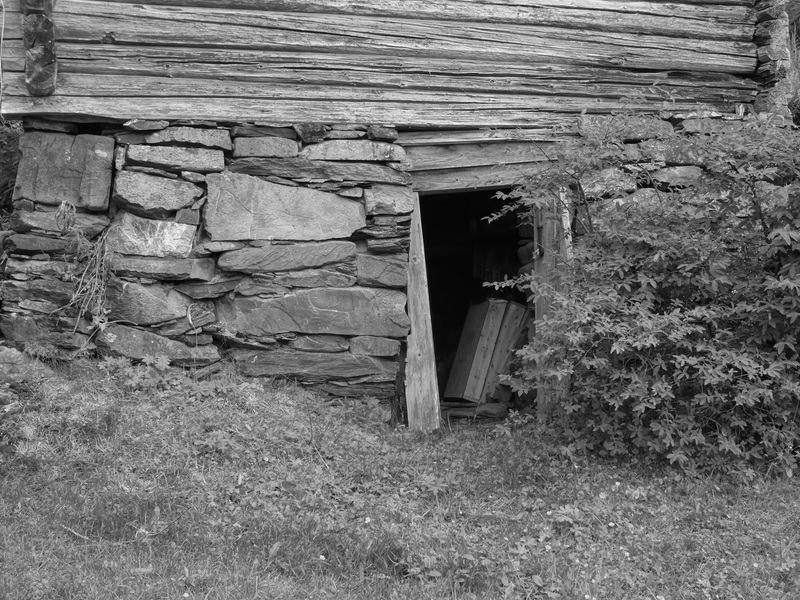 Beyond, is the old forge, and the barn. 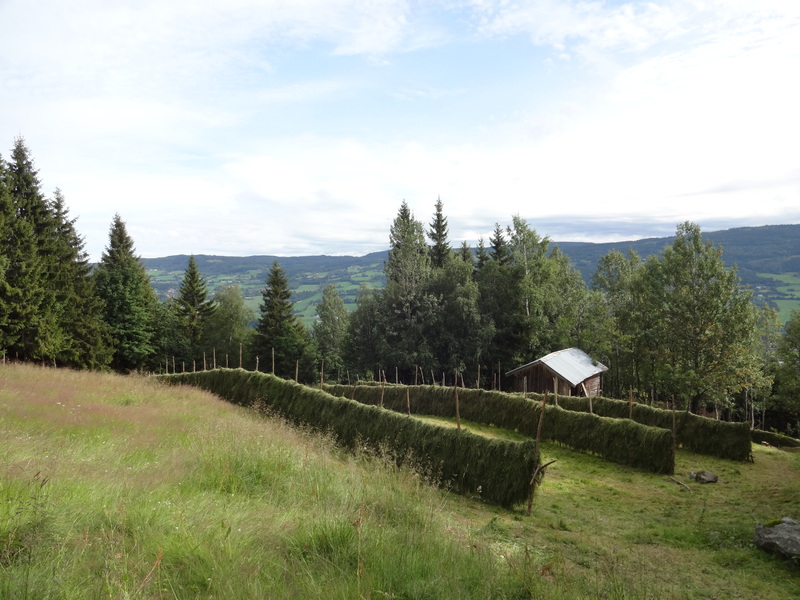 Nordre means North in Norwegian, this being the northernmost farm in this particular area. 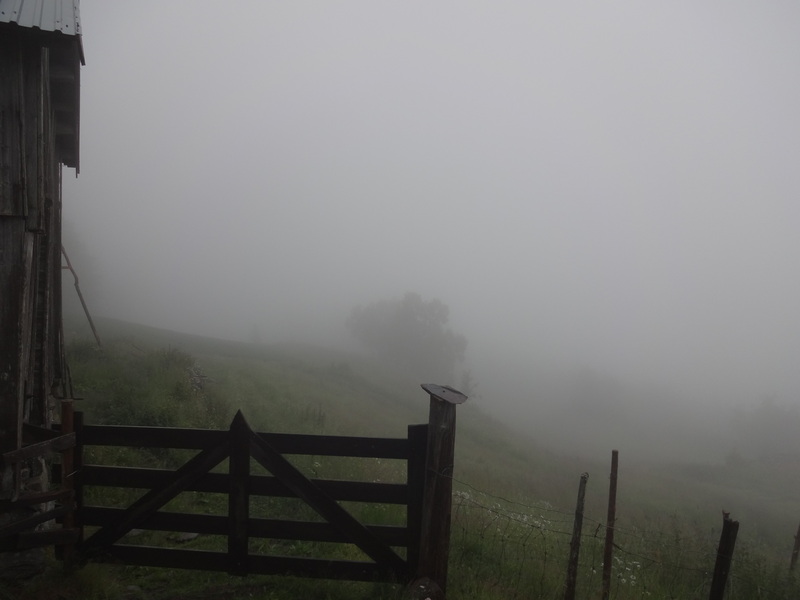 Above this farm is the “Seter” or Mountain Farm where the streams spring originates and where presumably the elusive cloud berries grow – more on these later, need to find them first! The heifers came home! 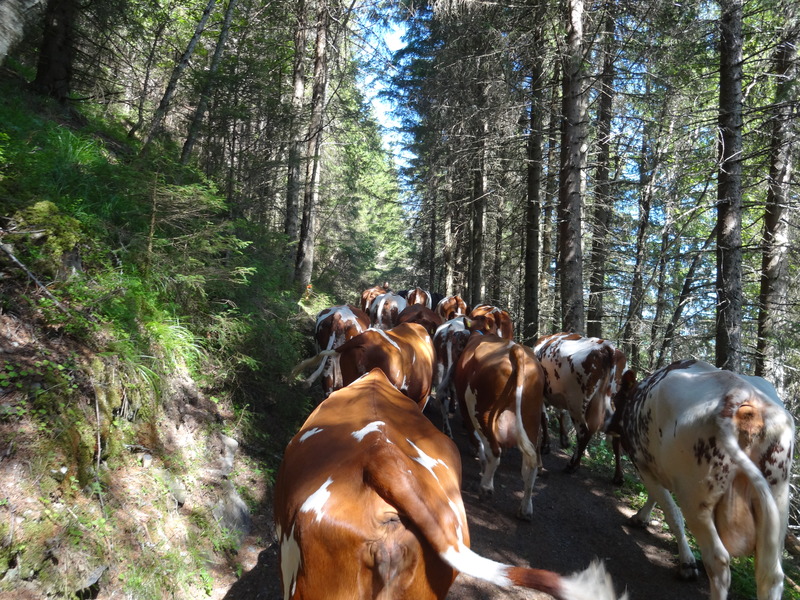 The host farmers let two heifers out to pasture and they did not return for an entire week – these are an old and hardy breed of livestock. This one’s name is Hornfager meaning “Beautiful horns,” she is so gentle and sweet. This is the view from the farm. 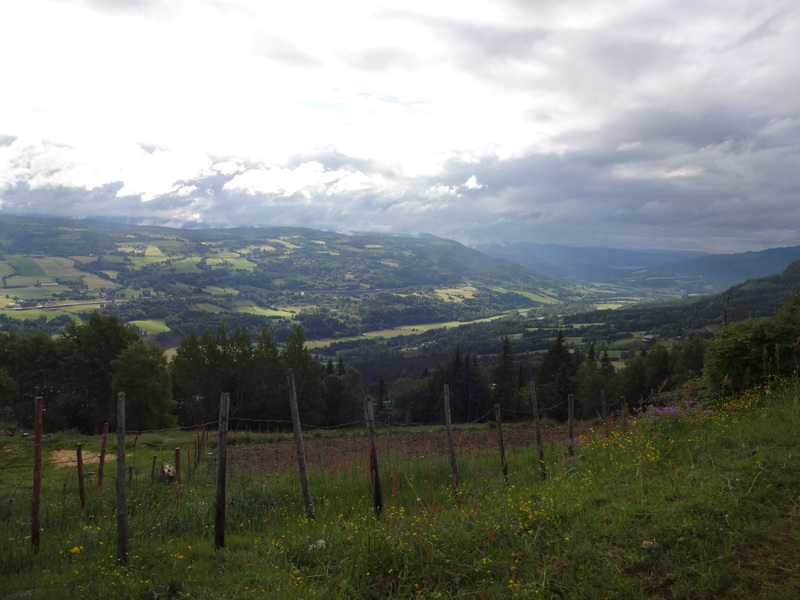 It is the Gudbrandsdalen Valley, in the distance to the right, is Lillehammer. Hornfager, she is so photogenic. Her sister was hiding from my inquisitive lens. 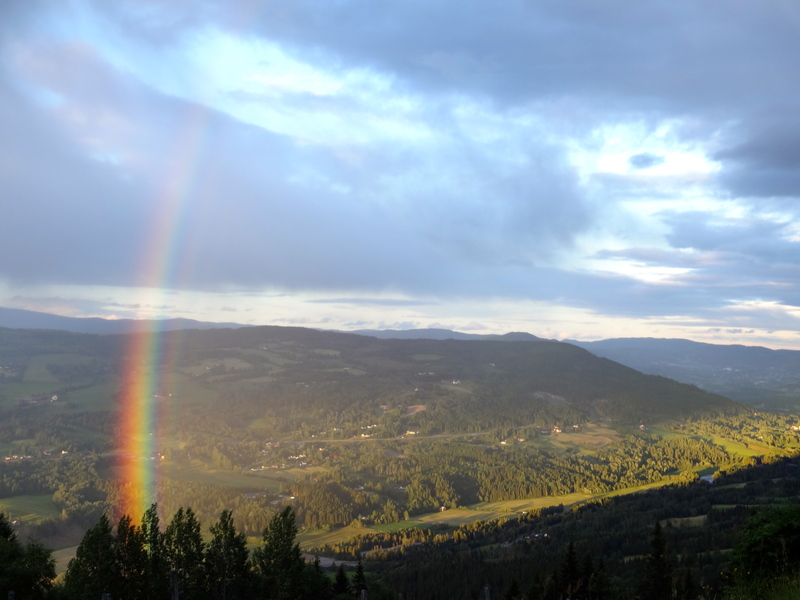 After a late night shower and just before the sun skimmed the horizon, this rainbow came around. The end of rainbow landed on the farm – a good omen perhaps? Gersemi, the Norwegian Forest cat. She was doing some stretches when I caught her mid-pose. She will have little kittens soon. 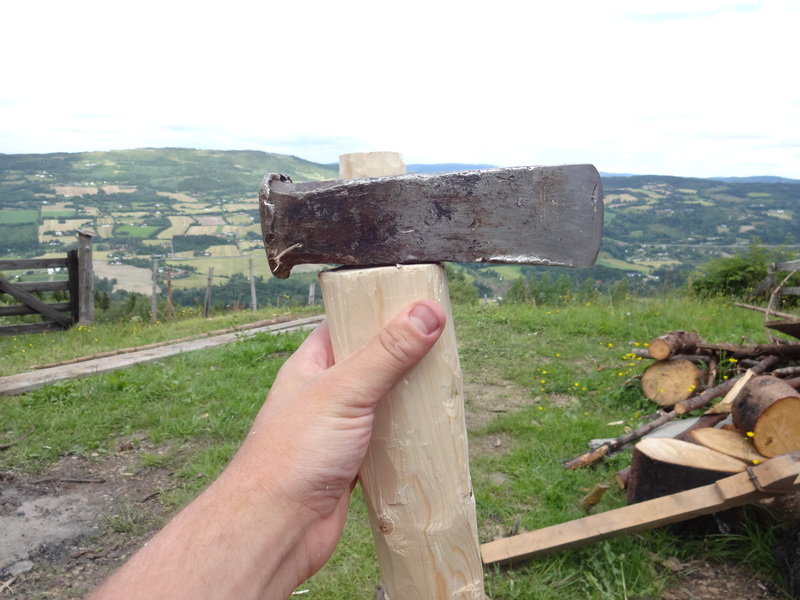 I broke the head off the old axe – so instead of going to the store, I got a piece of wood and got to work. 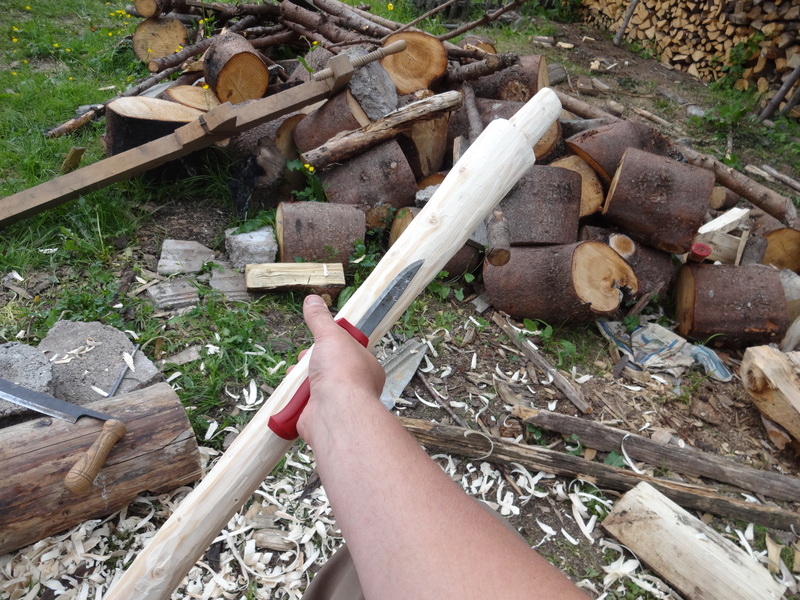 First came the hatchet work, roughing down the timber to a workable piece. 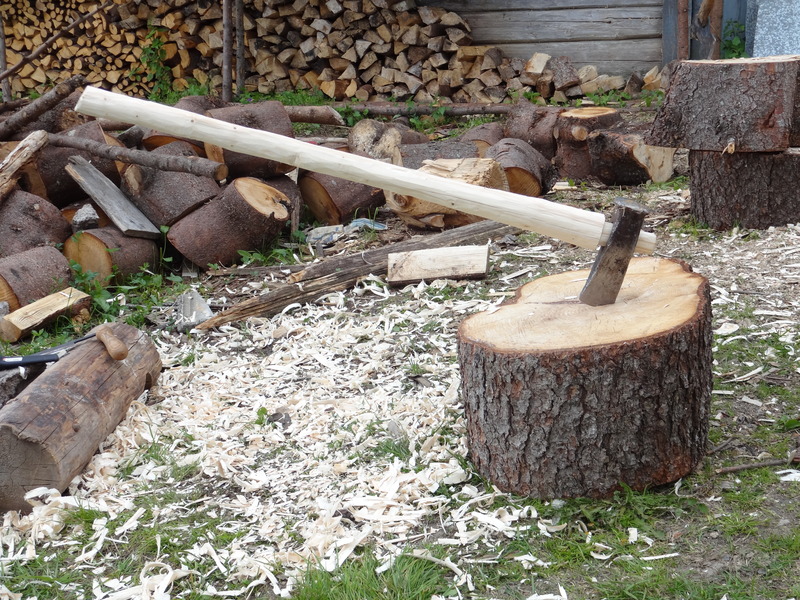 Second was the drawknife, this was rather primitive but with some padding and elbow grease I made it work. What I would do for a saw-horse. Next was my specialty, the carving knife – used a swedish make – a MoraKniv, fine steel. 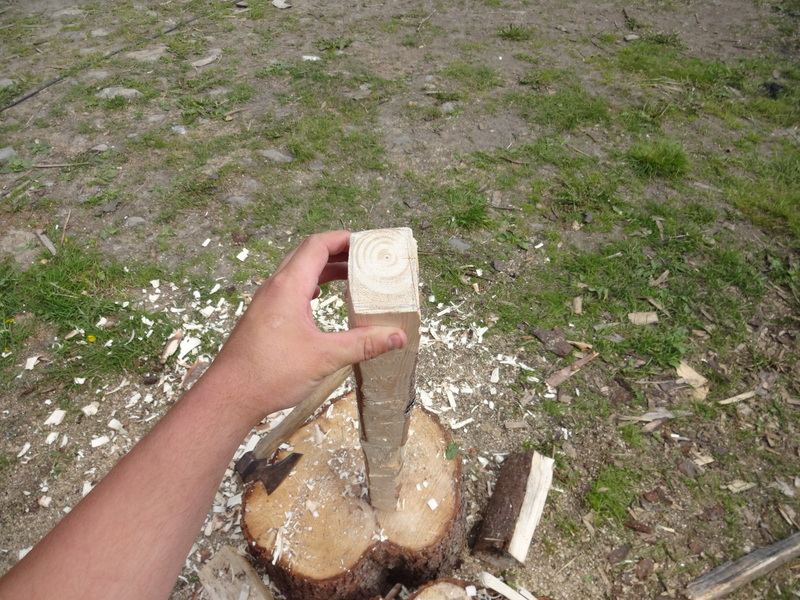 Also carved a tongue into the top to fit the axe head. I’ll be darned, took all day but it was rewarding work. Much more productive than typing away in the office all day long. 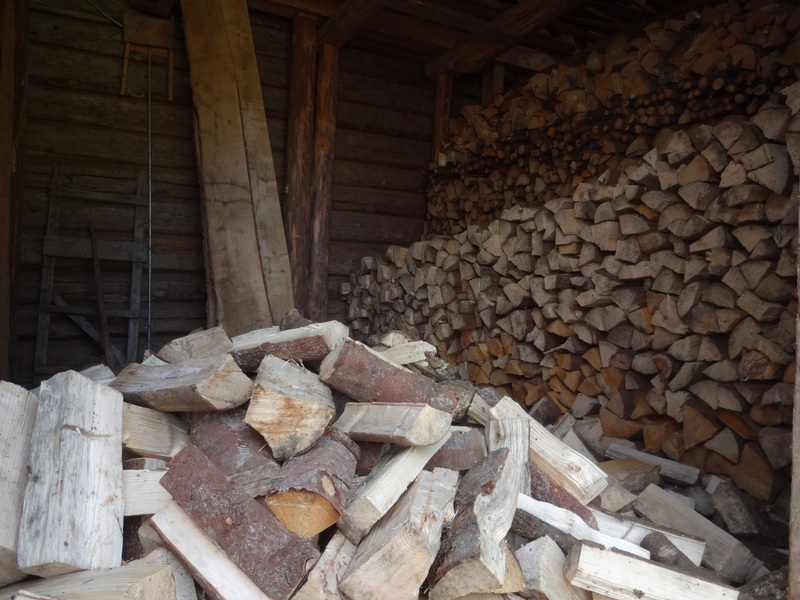 Fits snug and wedged with dried birch, this baby is ready for the woodpile! 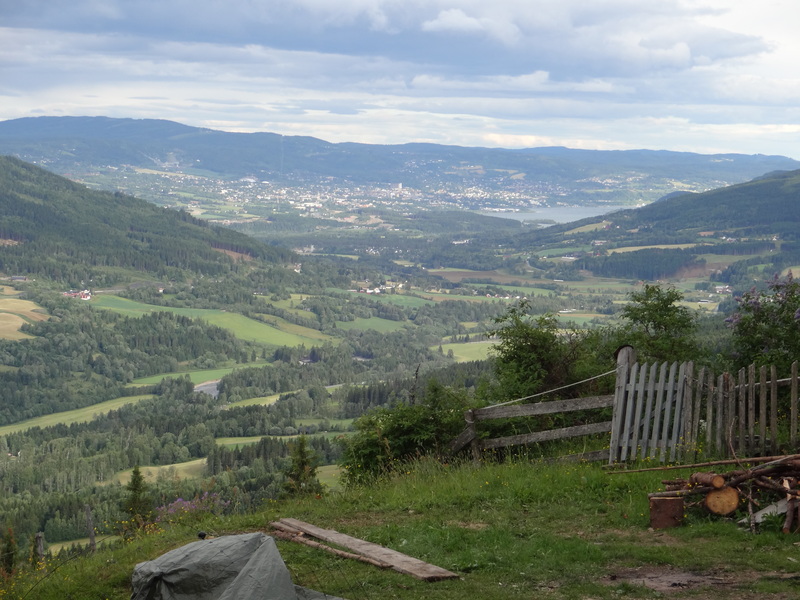 This is part of the buttress to the famous Lillehammer Ski Jump. I guess the jump is cool, but the view from it is amazing – this selfie took me about 10 times to master – worth it! 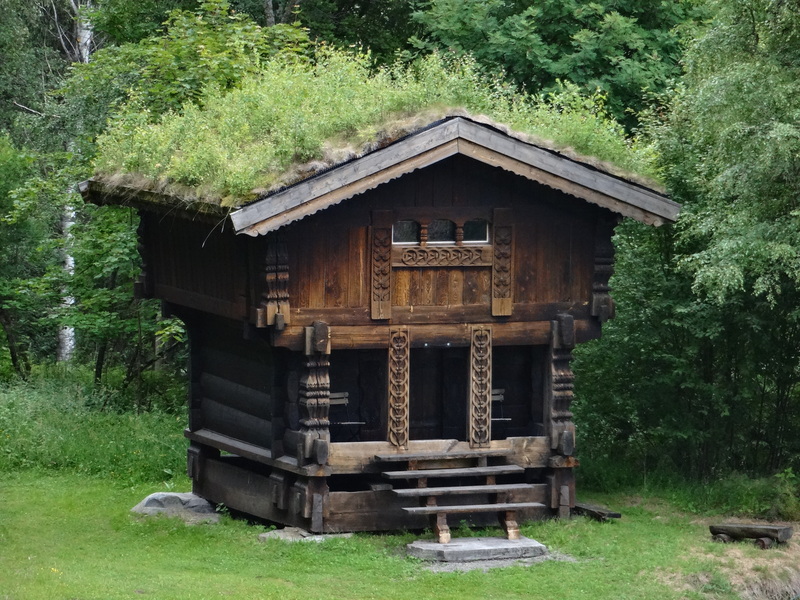 This is a Turf Roofed structure, typical of Norway. 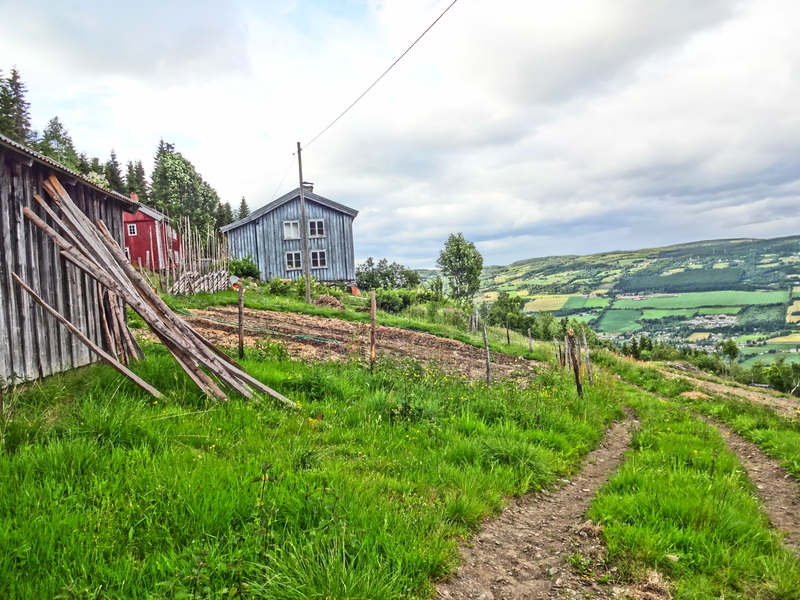 I got a bit lost in Lillehammer, but stumbled upon this awesome house! 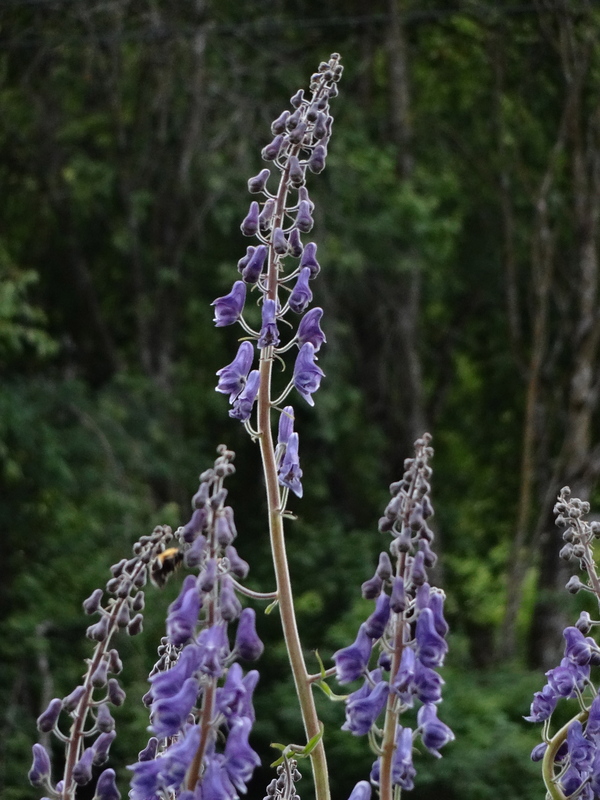 This flower is beautiful and apparently extremely poisonous – even to the touch! The flower itself looks exactly like a monks hood and they grow all over. I took a “stroll” down the road from the farm. 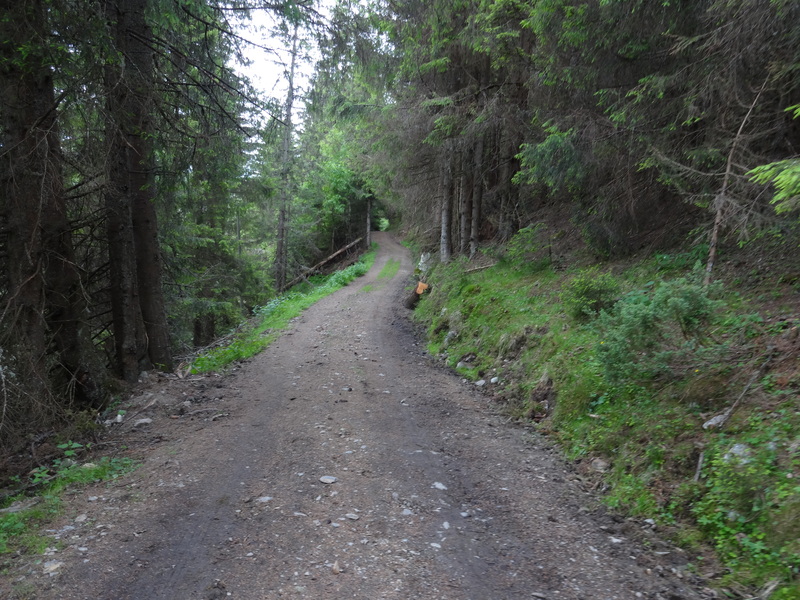 It was all downhill for a about a mile, and then I had to go back up…. 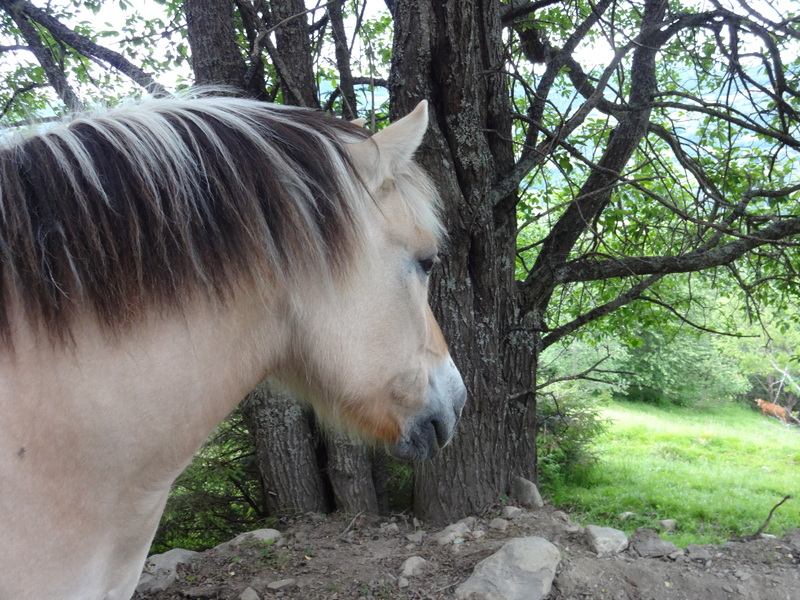 Freyfax, the farm’s lone horse is out to pasture. 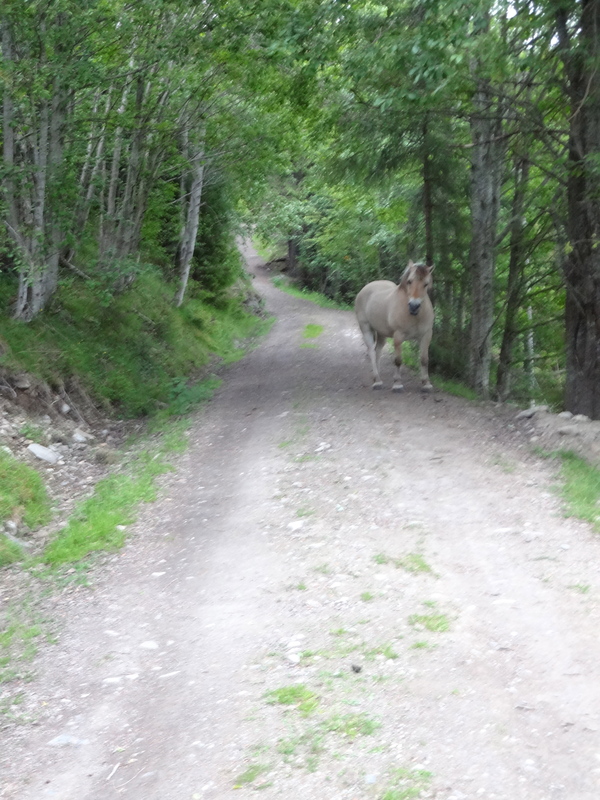 I met him on the road and could only think of Lord of the Rings as I approached, like some great steed out of myth. A close up, he is quite friendly and rather curious…until he realizes you don’t have an apple or a roll and then looks away as if betrayed. Still, he is beautiful and a friendly horse. 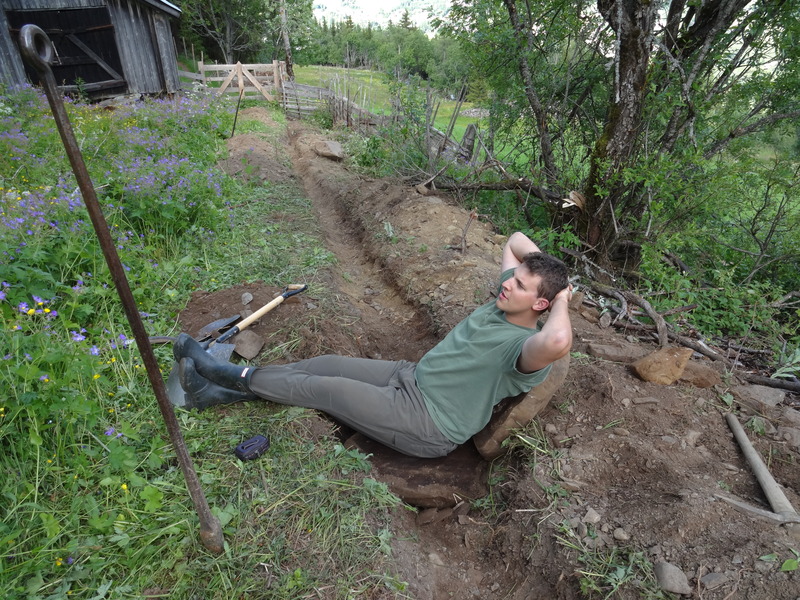 We (Quinn and Myself) dug a ditch to expand the chicken coop. The soil is rather stony, this particular boulder split perfectly in two which was rather convenient – a nice cool down from a long days work. 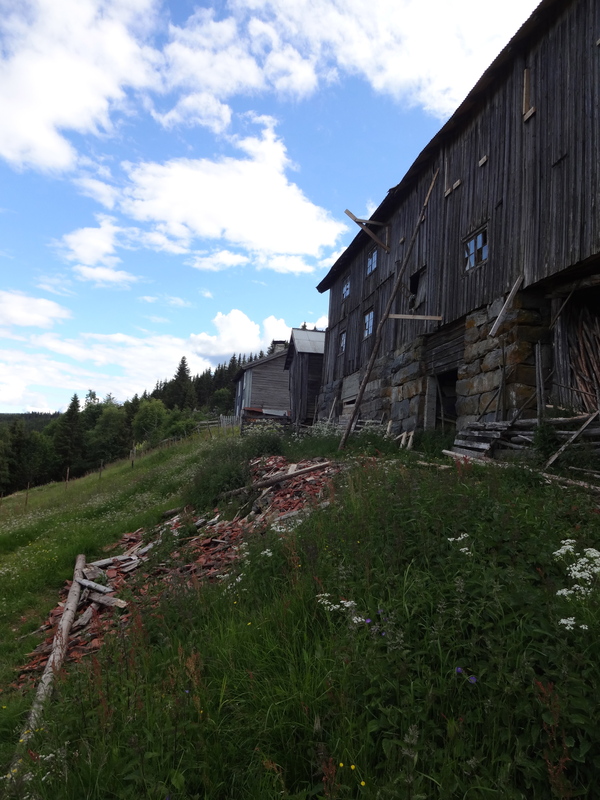 This is the big barn at the farm, comprised of two buildings (log-built) that were connected half a century ago, this massive structure is supported in turn by these monstrous dry stacked stones – reminiscent of Inca architecture in Peru…though not quite. 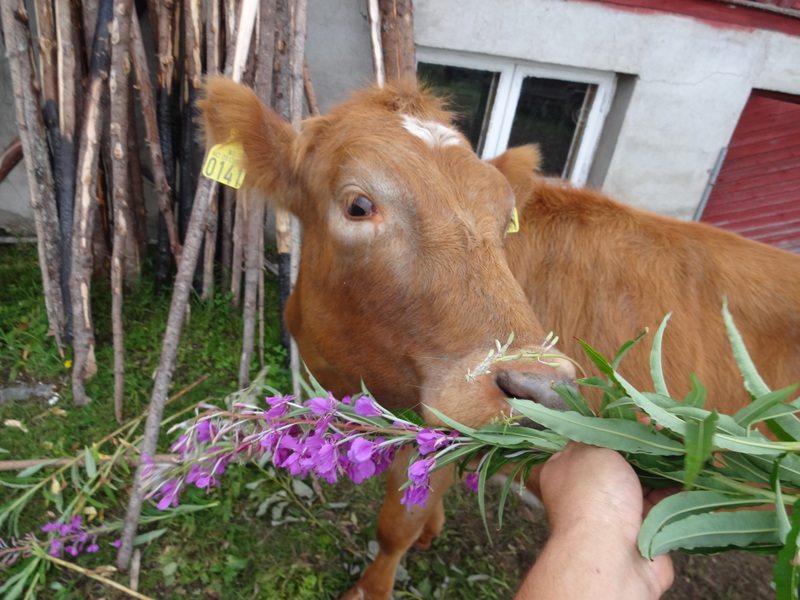 We feed the animals twice a day, this particular bucket is full of wildflowers and buttercups. The rabbits love buttercups. About to disrobe (keeping it g-rated), this is the bathing spot at the farm. The water is a frigid temperature but welcome after a hard days work. 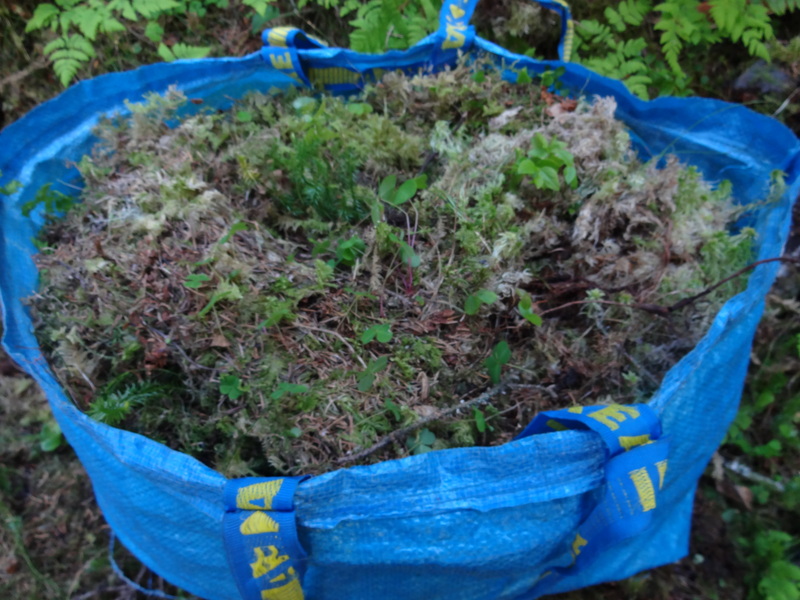 Ikea bags, the preferred method of moss gathering. There several different kinds of moss that cover the cliffs and hills here. Stacking, splitting, stacking, splitting. 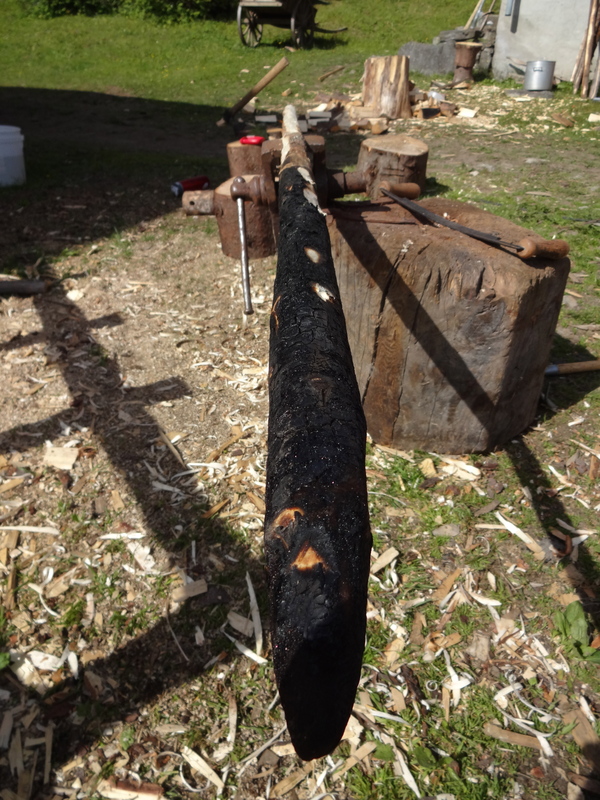 My arms are knotted and sore, but the wood keeps coming. This shed will supply the farm with 2 years worth of fuel. 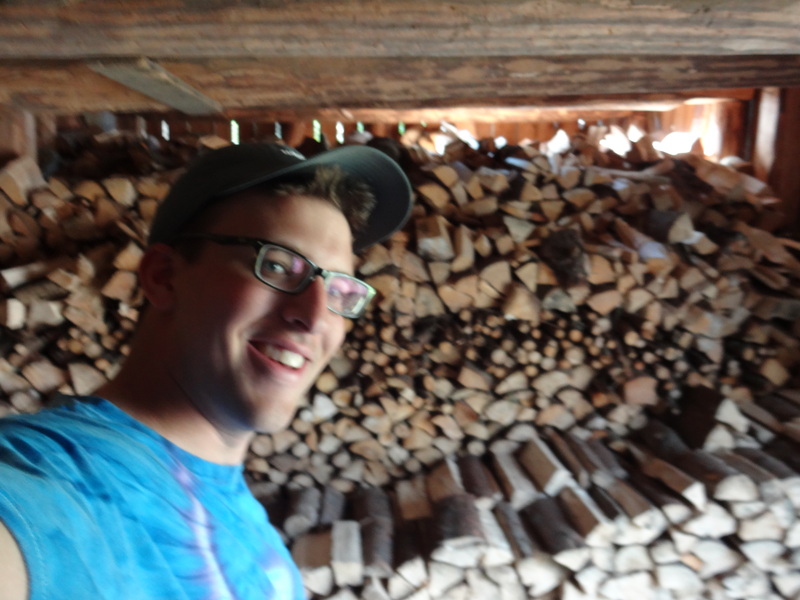 My attempt at a woodshed selfie. 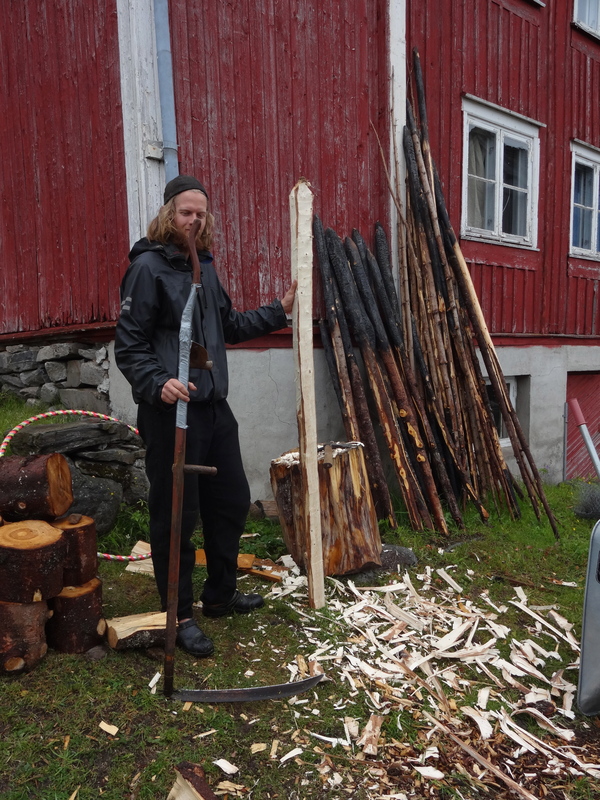 Dan, the farm’s owner and my gracious host is crafting a scythe handle out of spruce, same way I crafted the axe handle. He’s a bit more advanced than me, and a good teacher. Sunlight and ferns. It is a fairy tale land that I walk through each day. Blessed and beautiful. 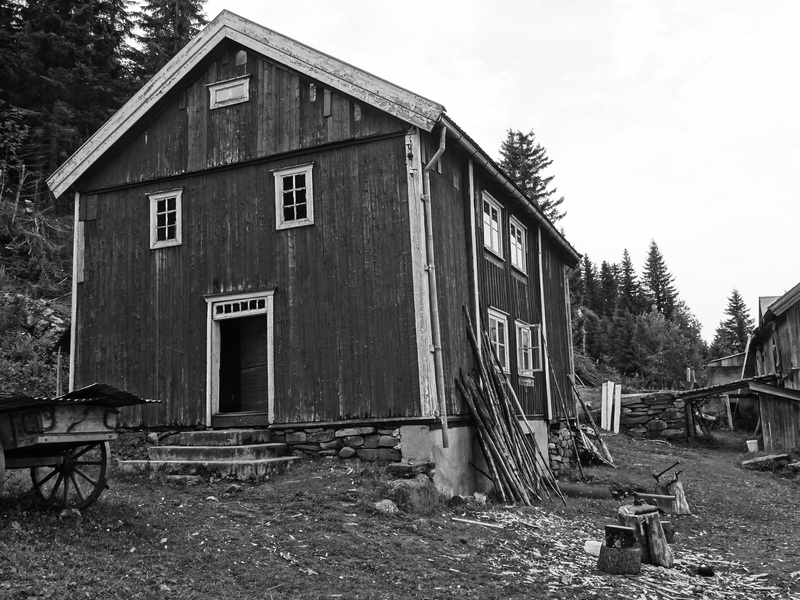 This is a Stabbur, a traditional Norwegian Storehouse. The 4 corners are typically raised by free-standing piles of stone and air underneath the floor to keep mice away and provide filtration for what is stored: milk, meat, grains, etc. 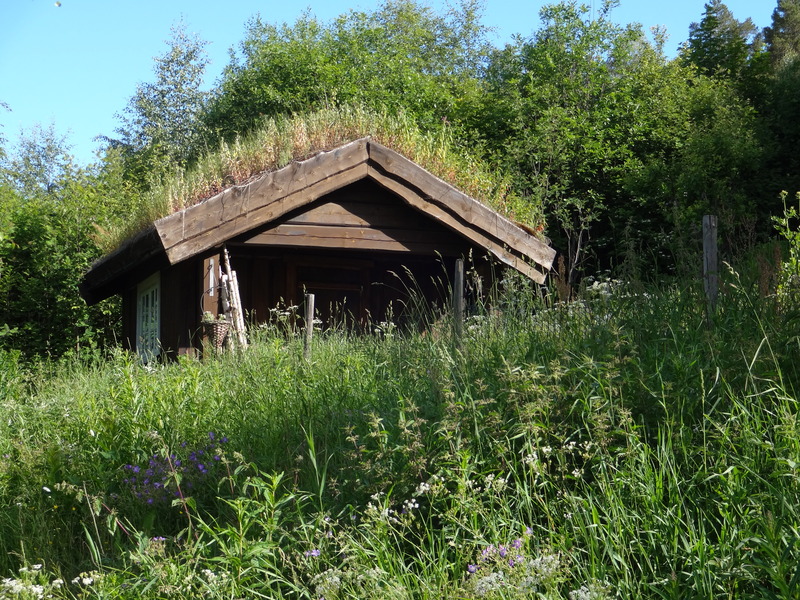 This one is converted into a lodge – complete with a turf roof! What may seem just a simple shrub, this will eventually become a blueberry bloom – and there are no bears in these parts, so its anyone’s game. 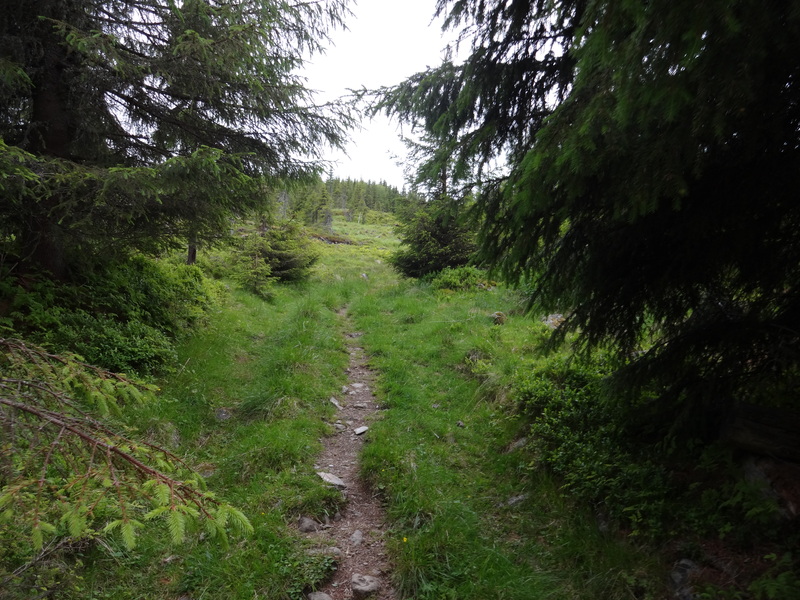 This trail leads up to the Mountain Farm above, in Norwegian, called the Seter. 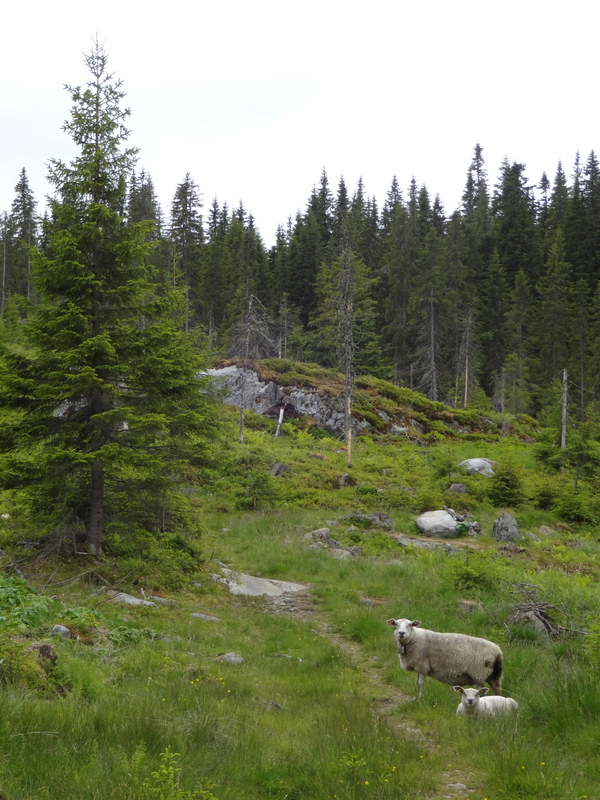 Not quite at the Seter, but this field was clear cut of trees, so outcroppings of rock could be deciphered and sheep in the plenty were grazing about. I managed to find this sun-drenched staff the color of bone. It looked a bit magical, so I was obliged to take a picture with it. This is my spacious bedroom. 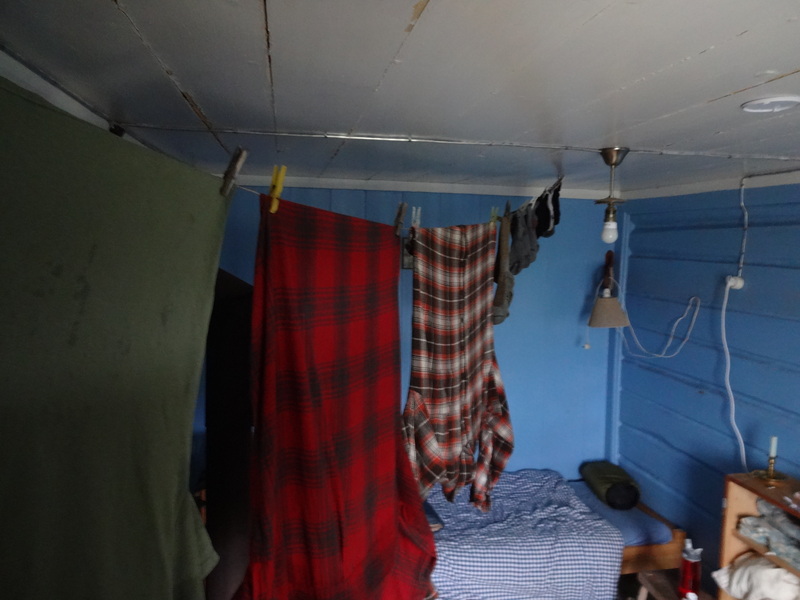 Located within the farmhouse itself, I have room enough to hang my laundry – it was raining out, so I took it in. 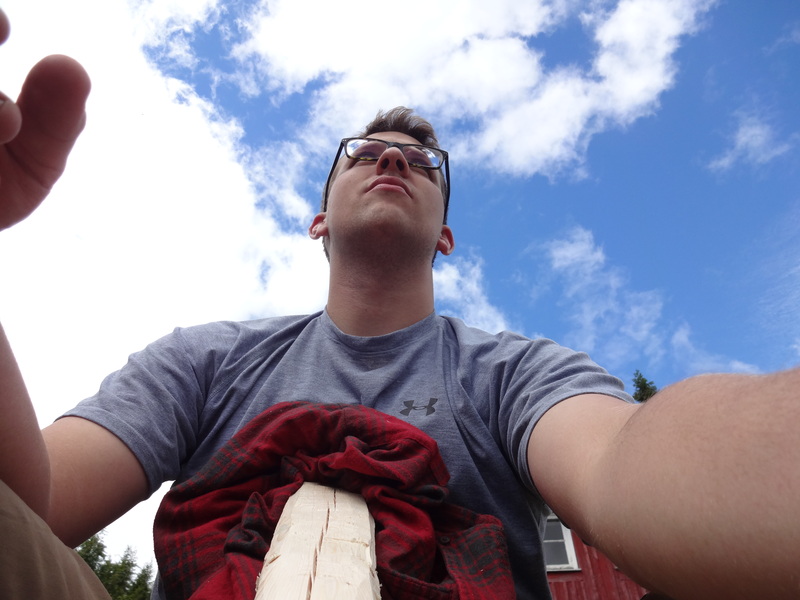 I was preparing to carve a rake handle with this piece of smoked Spruce. 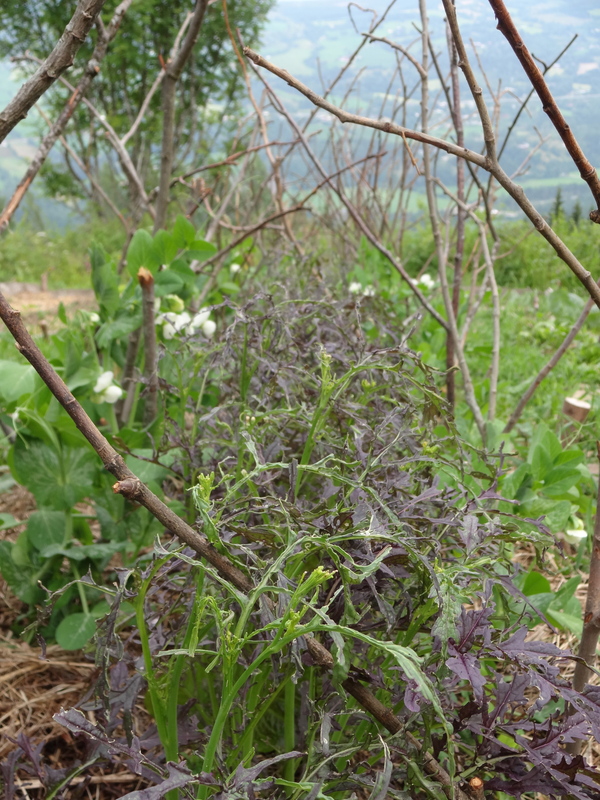 The end is charred so it will be less apt to rot in the wet climate here in the valley. I carved this piece into a nice rake handle that will hopefully last the farm well into the next decade. 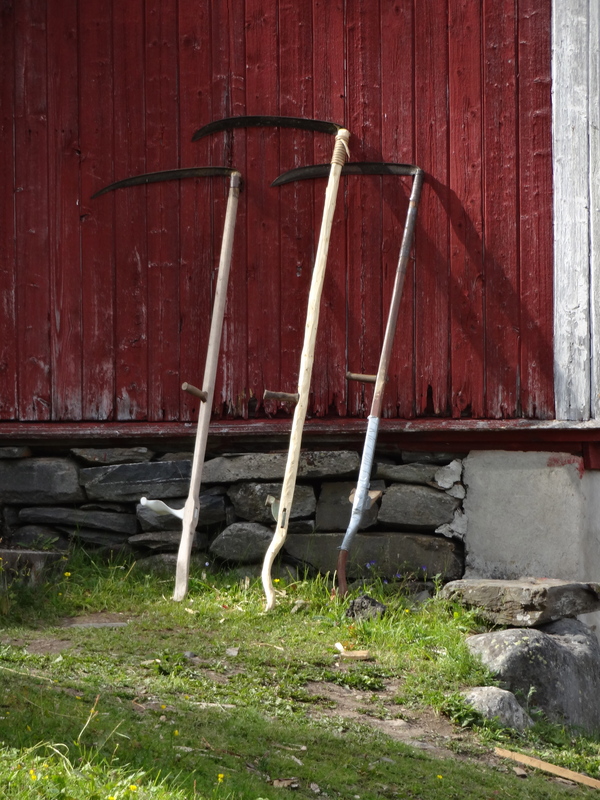 Scythes, both old and new awaiting use on the red-house wall. 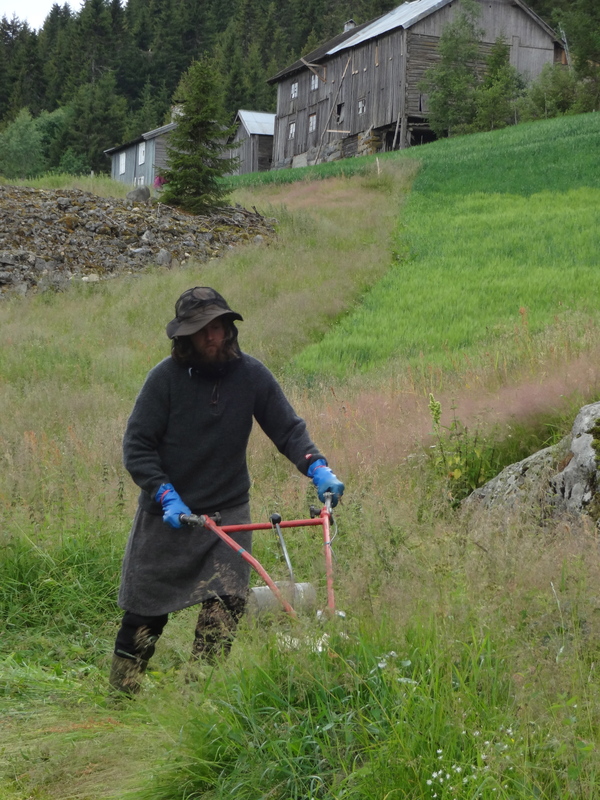 the middle scythe’s shaft is newly crafted by Dan, my host. A splendid job, and one that will last for many years. 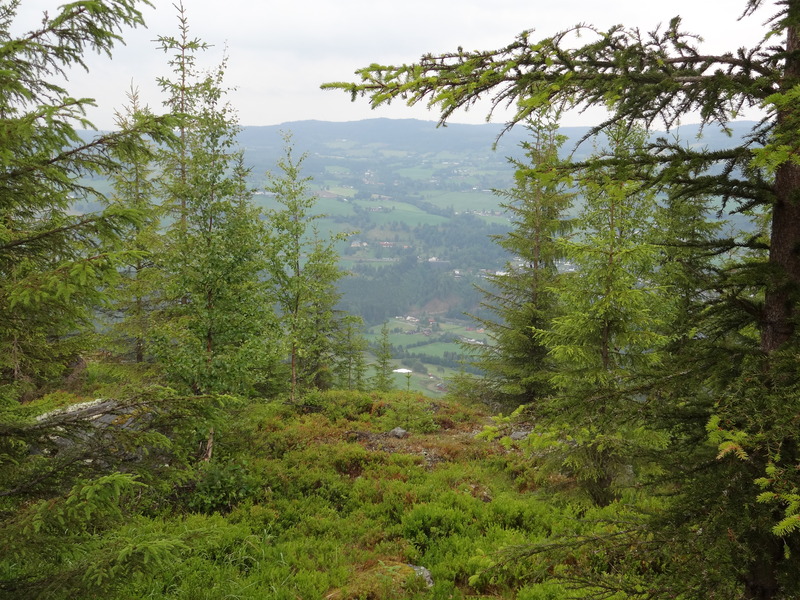 There is an old hiking trail that runs around the farm, frequently used by local trekkers, this trail has many incredible vistas of the valley. 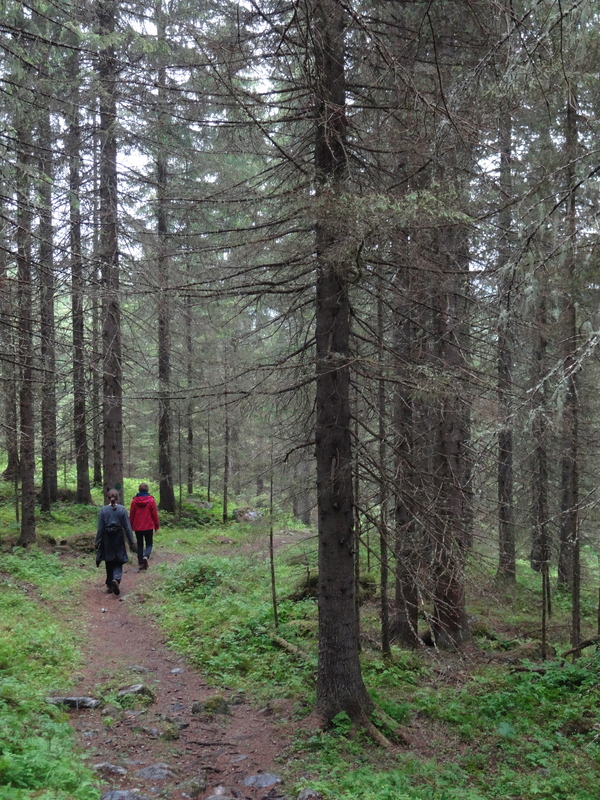 The girls, Kim and Camylle walking amongst stately spruces. 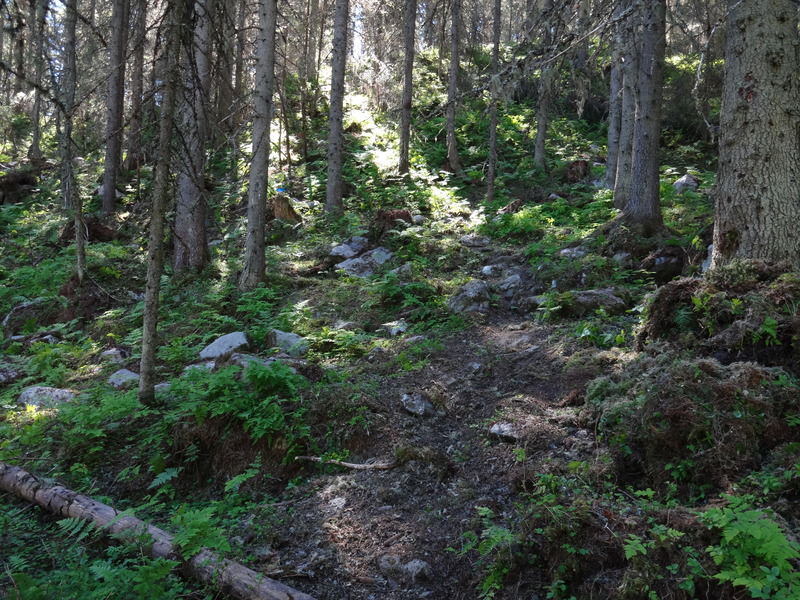 They are not pictured, but there is overgrown boulders the size of small houses that line the path. 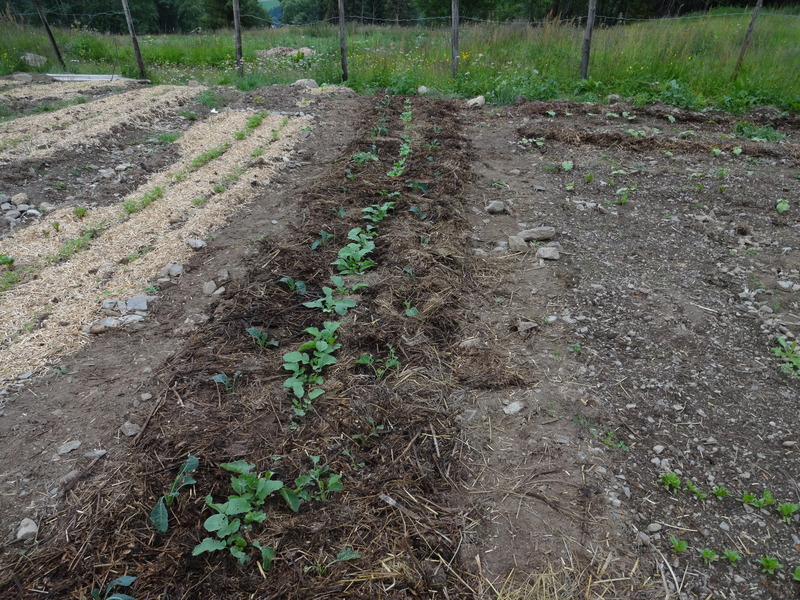 We transplanted kale, dividing up the bunches to allow more suitable growth for each plant. 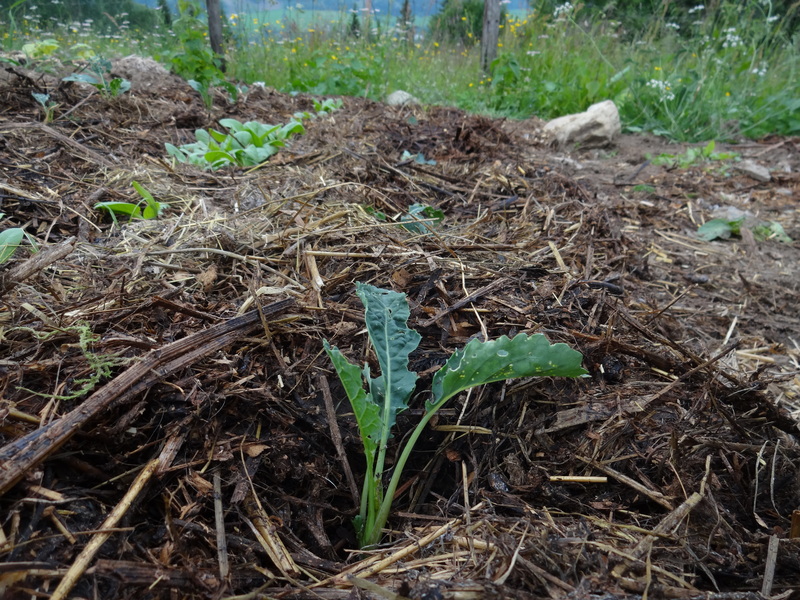 After we transplanted the kale, we mulched the beds, this mulch is not the typical “bagged” mulch found at Home Depot, this is raw organic mulch made from rabbit/horse/cow/chicken feces, straw, mud, and pretty much anything else. We dug our hands right in. Yum! 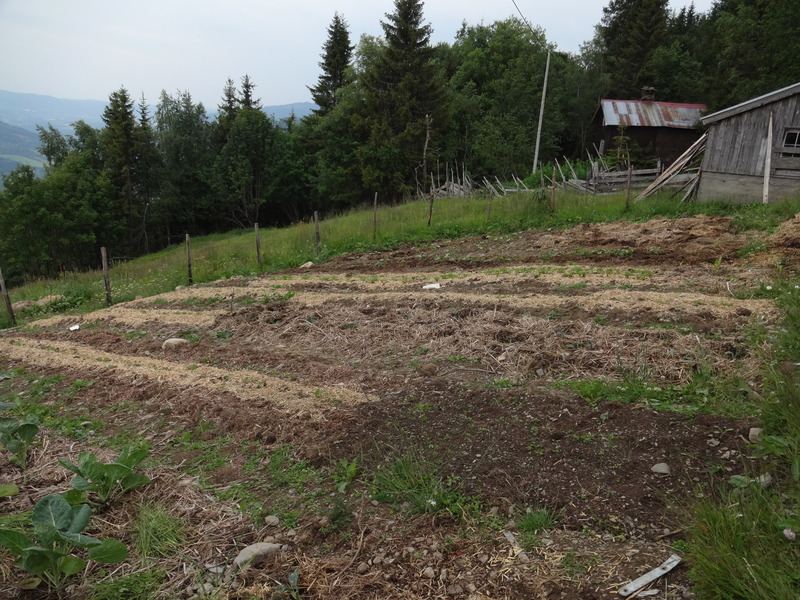 This garden contains vegetables such as onions, kale, peas, and even pumpkins. The soil is tremendously rocky, so I give a lot of credit to nature as each plant has continued to thrive despite the odds. This salad green is particularly delicious. The name escapes me, but the taste is quite diverse, refreshing and organic, the aftertaste is rather spicy – its great with bread and cheese. 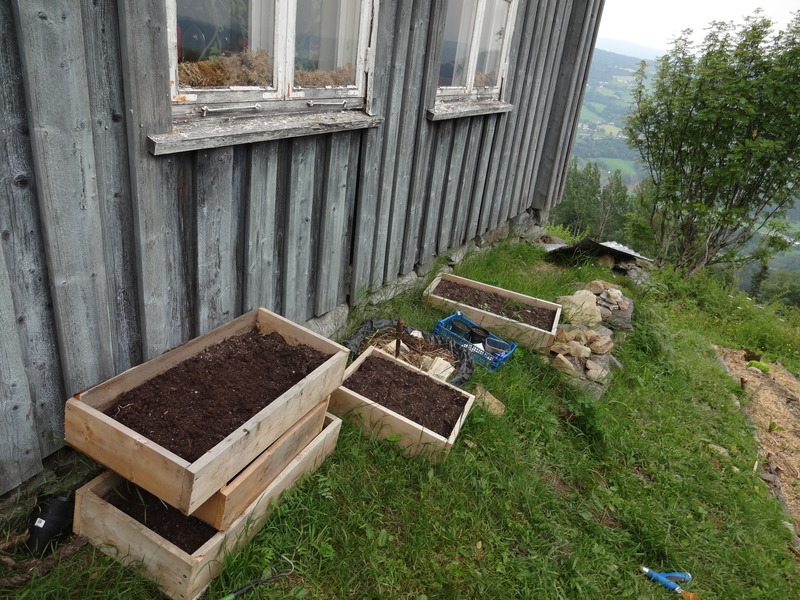 Starter beds line the farmhouse, my host Hanna has planted several experimental crops in these boxes – including hops! This is the front of the Carpenter’s Cabin, all the barns and houses have these curious birdhouses lodged in their roof peaks. Inside this place, there is an array of old tools and workbenches, the scene looks like it is out of time. 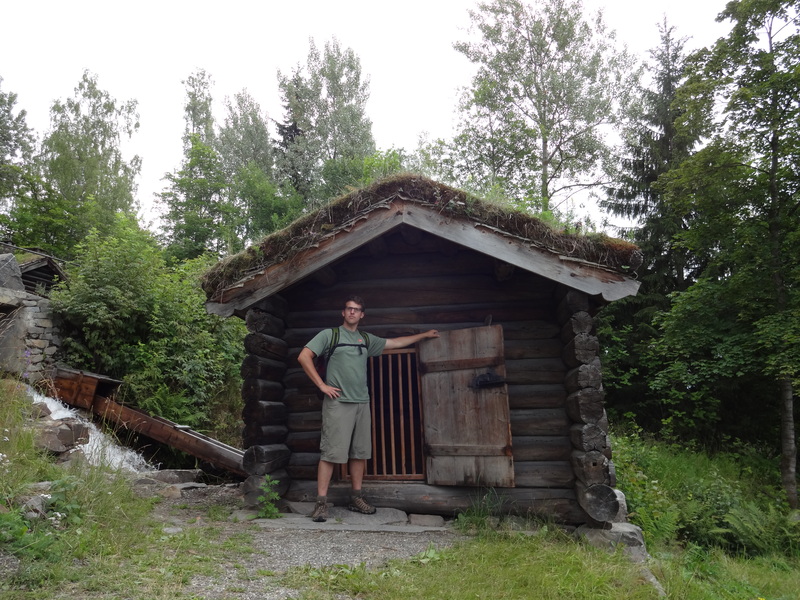 This door leads to the basement of the Carpenter’s Cabin. It is intriguing to look at, like a gateway to another world. 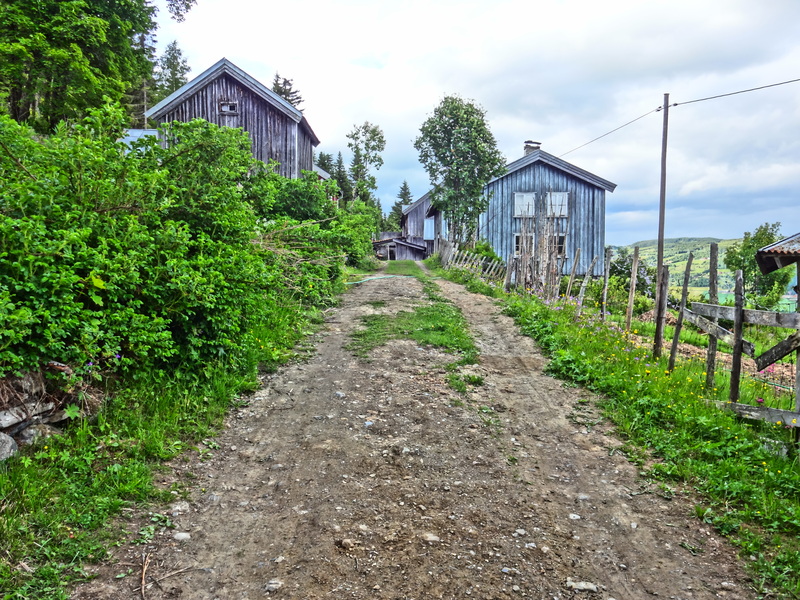 Originally, this two-story house accommodated the one of the two families living on the farm back in the mid 1900’s. Now it accommodates volunteers. This is an adjoining shed off the main barn and it butts up to the compost toilet. 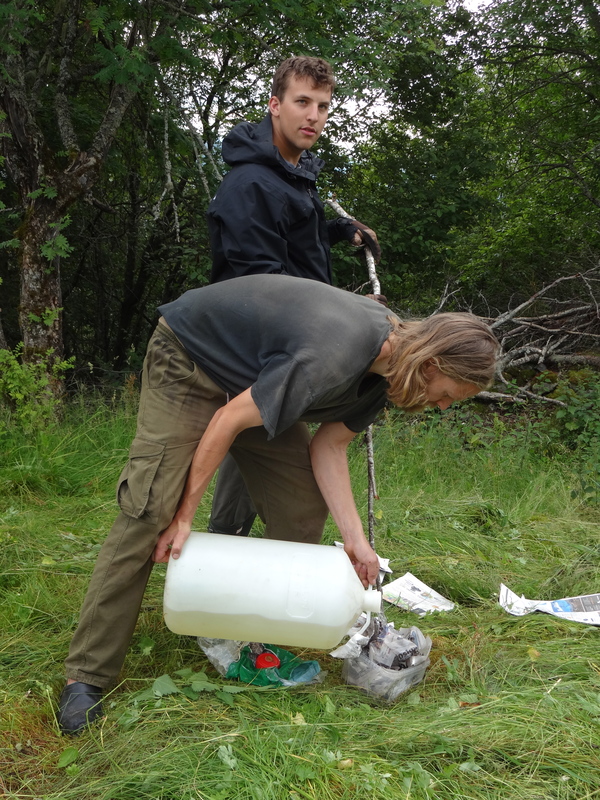 The Compost Toilet uses moss gathered from the hillside and obviously you know what to create fertilizer for the fields. Before you wrinkle your nose, think for a moment about that horse manure smell we all know and love – same thing, just human. You should be a proud mother, what an adventure he is on! Sean! These photos are amazing, and the captions really help bring them to life, and provide great perspective. Awesome job, badass axe. Keep em’ coming! I plan to, thanks! Say, when are you coming out here to meet me? 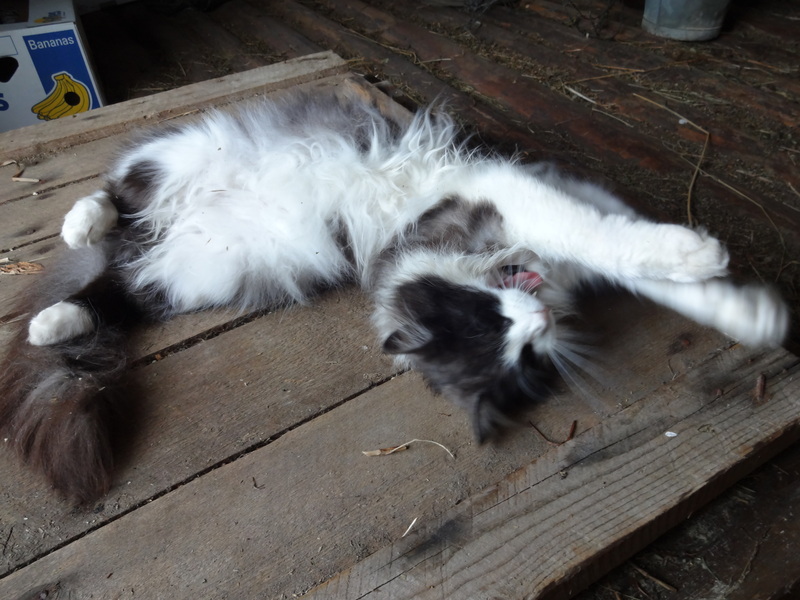 We have a forest cat on the farm, and she is about to have kittens! Muchas Gracias Tia! I woke up this morning to the clouds intermixed with the tall spruces, I am absolutely in my element – thank you and I love you too! Thanks John, the farm’s resemblance to Cuba is uncanny – hauling water from the stream, ben franklin stoves and reading/writing by candlelight. If I have the itch to do this back home, you can count me in for some heavy labor! Thanks for sharing these pics Beardless Farmer! Love the axe handle, very nice work! Ha! Thanks, I am learning so much practical knowledge day by day. Perhaps OEP-worthy in the future? Nice to hear from you Tim and thanks! Looks like your having blast. Enjoy the experience and I look foward to more entires on your adventure. Be safe and make sure to make some bad decisions over there that only you will ever know haha. Great pics Sean! It sounds like you are truly loving your adventure, enjoy every minute. These memories are forever! 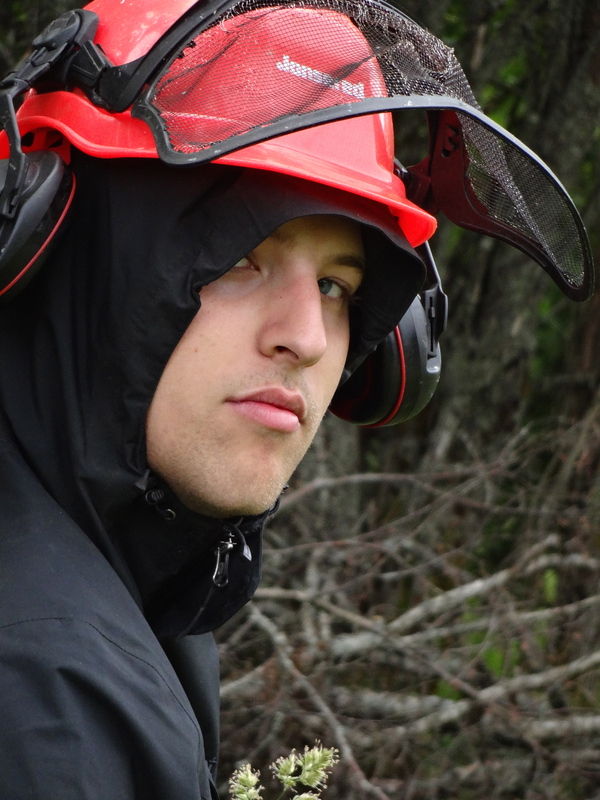 Good luck and as always…..Be Safe. Absolutely and thank you. Being on the road gives me a new understanding of “safety,” and I am often thinking about our conversations of awareness whilst working. Thanks Tedd! Thanks Aunt Teresa and Uncle Joe – my misadventures seem to be the focal points of my time here at the farm, hilarious and plentiful, I am still working on winning over that rooster! OMG SEAN!!! I love seeing these pictures and your comments! I can’t wait to see more! You are going to have some amazing stories! More stories each day, and writing it all down – can’t wait to share them with ya over a pint! Favorite pic so far is the horse on the road to town. Totally MiddleEarthy. Your forest shots look a lot like the Adirondacks actually. Mossy rock outcroppings, ferns, red pines, etc. Always looking forward to your next entry and pictures.. don’t forget the pictures! Lots of love brother! Lots of love, thanks Sis! Sean, great photo update this week! I loved seeing all the farm hands- they all look like such nice people, and it looks like you’re having a good time! Nice to see the steps of haymaking, too. I was wondering how you dried it. Do you bale it somehow after it dries? That little cabin with the stream running through is perfect! 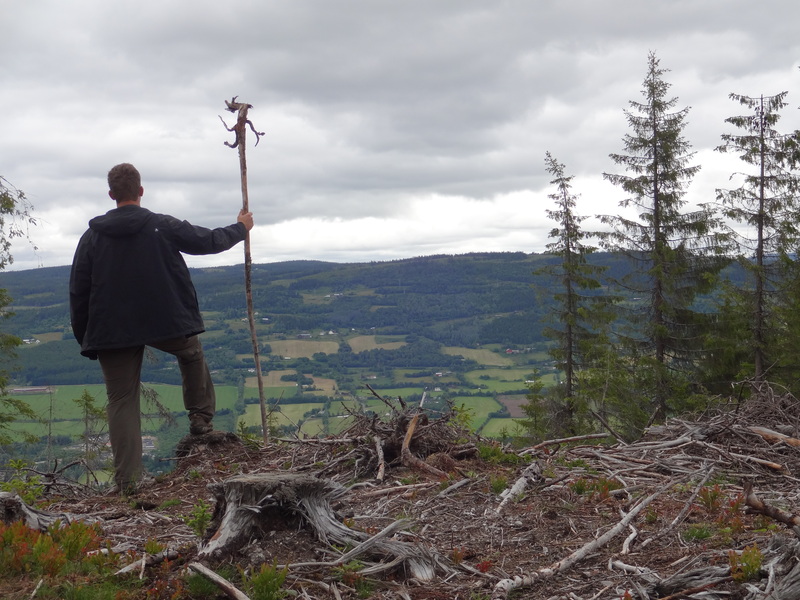 But I thought Norwegians were tall…. Anyway, have a great week, we will be thinking of you! Btw, what happened to Camille’s hand? Sounds like you are definately making some good stories for the lifelong competition (Sean knows what I am talking about). Also looks like a lot of hard work running around with cute European girls and setting things on fire. Making progress for the lifelong competition, that is for sure – and more to come with each footfall. Thanks for checking up Chris, hope to hear from you again. Hola Senora Hanitz, It is so good to hear from you and yes, writing has become quite a joy for me. It is a connection to the lovely folks back home, and abroad. I hope to be able to use my espanol, as my Croatian is rather primitive :-). Thanks for following the blog, hope to hear from you again. Adios!